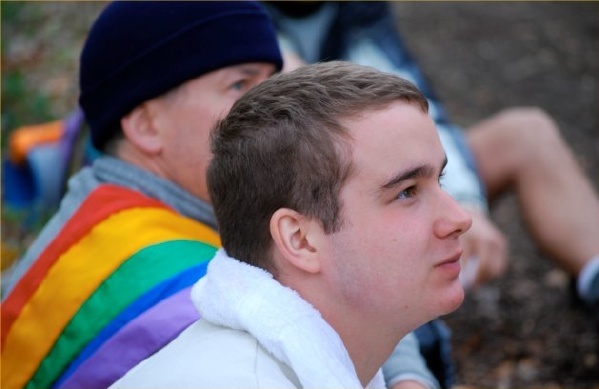 The walkers that had been gathering for the past 2 days at the All Saints Church in Battersea woke up around 7am. Thanks to many food donations from many people we were able to set up two tables: one for food items to make our individual lunches and a breakfast table. We had a traditional morning circle ending with a good morning round hug. We started loading the van around 8am and surprisingly were all packed up and cleaned up before 9am. 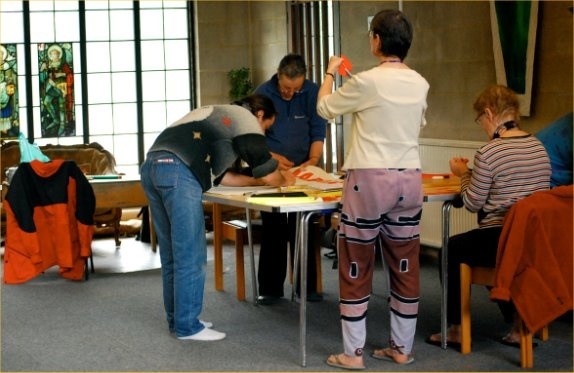 All Saints Church in Battersea was a wonderful support to the Peace Walk, not only was this great space for us to prepare ourselves for 2 days before the walk - this church was right across the road from Battersea Park where we began the walk. 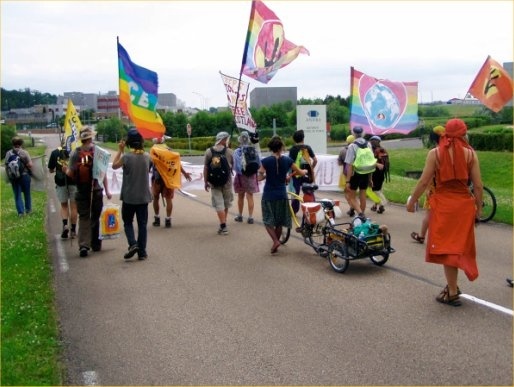 At 9am we finally got ourselves sorted and with many banners raised high to declare the beginning of the walk 18 of us set out for the Nipponzan Myohoji Peace Pagoda. 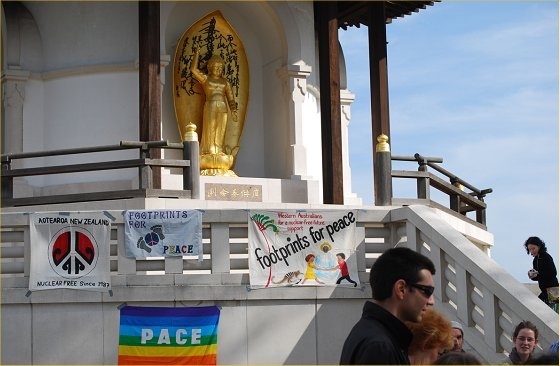 We arrived at the Peace Pagoda where we were met by other walkers and people who wanted to wish us well on our journey. There were between 50-60 people at the pagoda, 39 of which made up the walkers for the day and Jean who was our support vehicle driver. 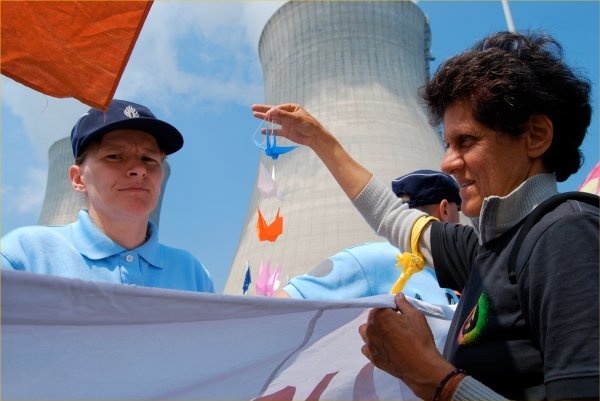 In a ceremony to remember Chernobyl we had people offer words, poems & songs & well wishes for the walk. 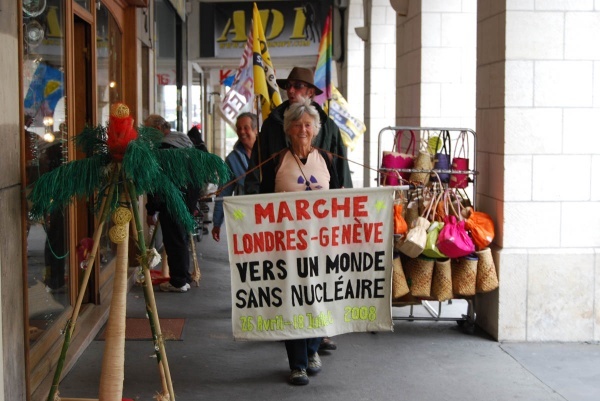 One our most inspirational speakers was Bruce Kent – Abolition of War and the Vice President from Campaign for Nuclear Disarmament who for over 50 years has campaigned strongly against nuclear weapons and he himself walking London to Geneva many years ago. Presenting the walkers with some sugar treats we began our journey from London. 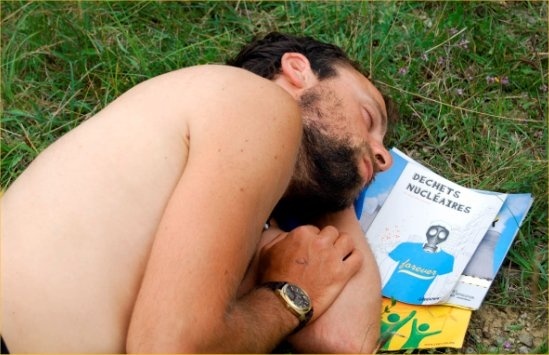 Chernobyl was that the worst is yet to come”. At around 11:30 we took our 1st break about 20 minutes long. Our next stop was at Richmond Park for an hour long lunch. 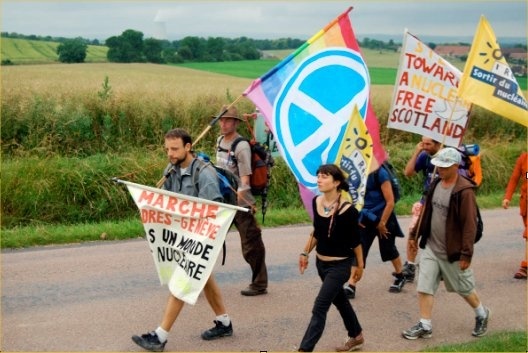 The walkers came from at least 9 different countries: U.K., Scotland, France, Japan, Australia, Sweden, Italy, Canada and the U.S.. 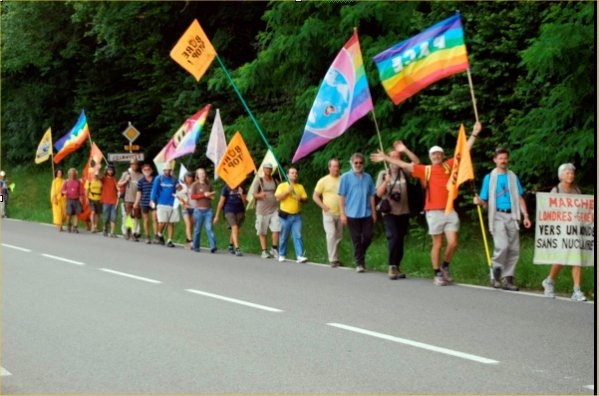 Many of the walkers today are only walking in the U.K. for, 1, 2, 3,4 or 5 days. Each day some walkers will have to leave and new walkers will join. Around 10 of us intend to walk the entire walk. It was 5pm when we reached our stopping point for the day. At that point some of the day walkers took a train back to London. The rest of the walkers hopped on a bus or in Jean’s car to get to the Friends Meeting House in Kingston that we had walked past earlier in the day. Fred was waiting with much appreciated hot tea. 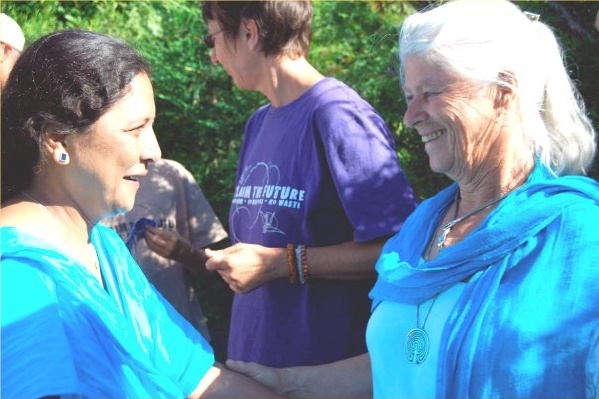 It wasn’t long before the Friends and local peace groups had a wonderfully delicious meal for us, which we ate outside in a beautiful garden area. 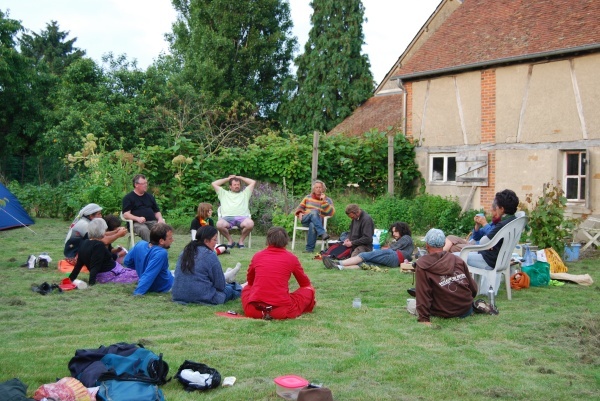 After we ate we had a small public meeting with people from the Friends and local peace groups. 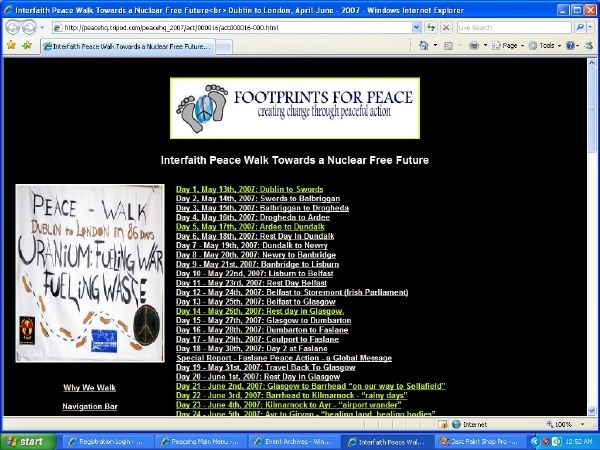 We showed “Nuclear Connections” on last year’s peace walk and spoke on the issues happening around the world. We woke up to another beautiful sunny day. 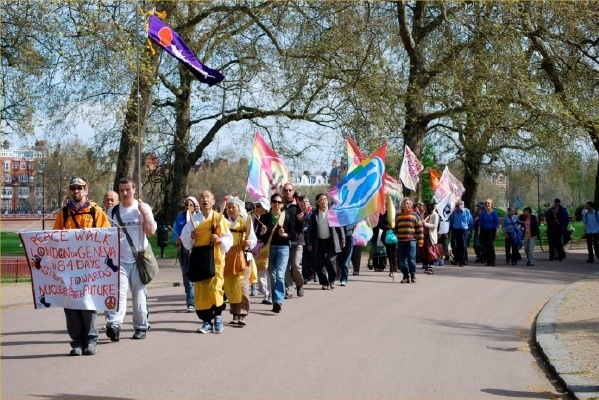 With our beautiful banners blowing in the wind we took more steps towards a nuclear free future on our way from Esher to Guildford. Today was a long days walk … but still the spirit of the walk very much alive. 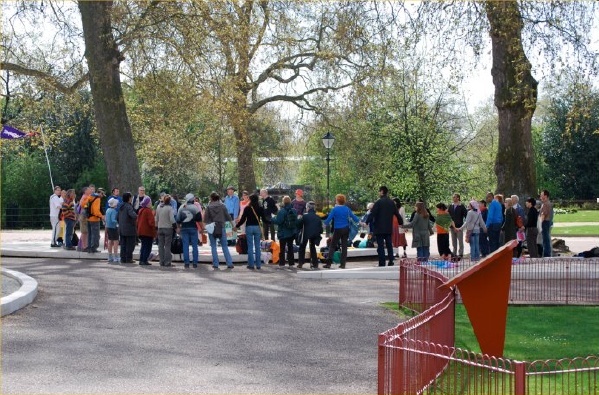 There is 21 people walking – which is great to start on the weekend so people can join for at least the first 2 days. 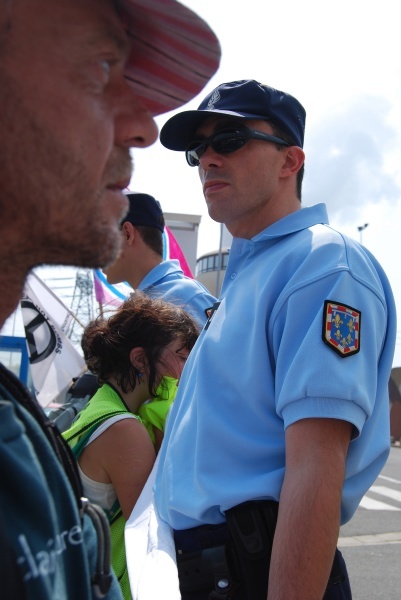 We were greeted by the local police who were “just doing a routine check” on what was happening…we didn’t see them after that and continued our walk. Again we couldn’t find any stay place in Guildford and had to transfer walkers to Godalming Friends Meeting House. 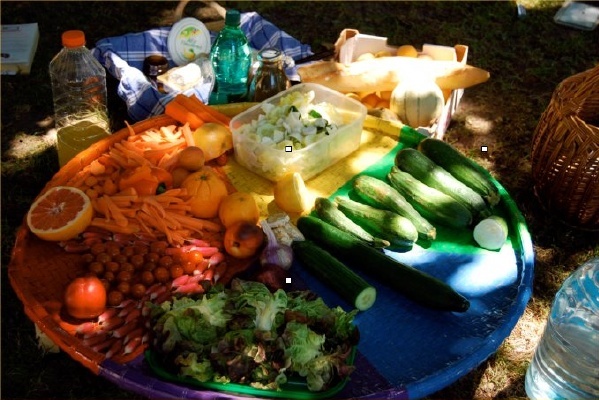 Friends of the Earth – Hillary and Kathy greeted us with lots of delicious food which all walkers appreciated. The stay place on this night was cosy and saw all 21 of us squished into a small but delightful room to relax. 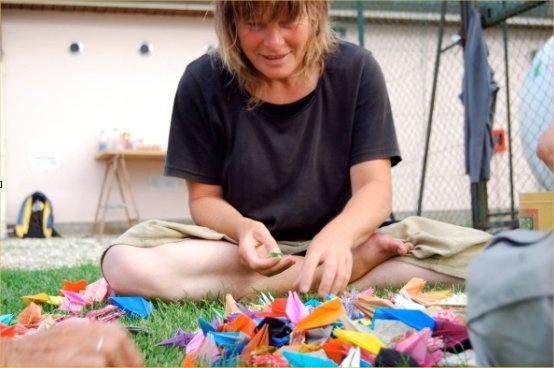 It was warm and the sound of soft guitar played by Marcus (from England) and the delight of walkers folding peace cranes was a typical sight on walks. 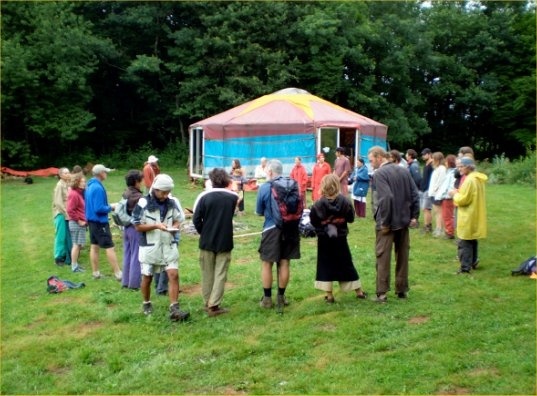 People massaging each other, treating blisters, drinking hot tea, conversations, sewing the banner…was all too familiar and homely. 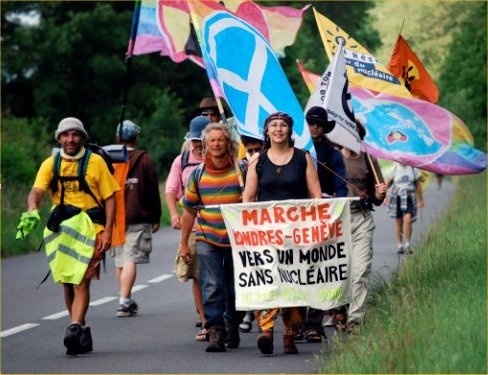 Our banner for France is being put together by all the walkers driven by the mad sewer Jill from Scotland. Its great to see and will be wonderful to carry in a few days. 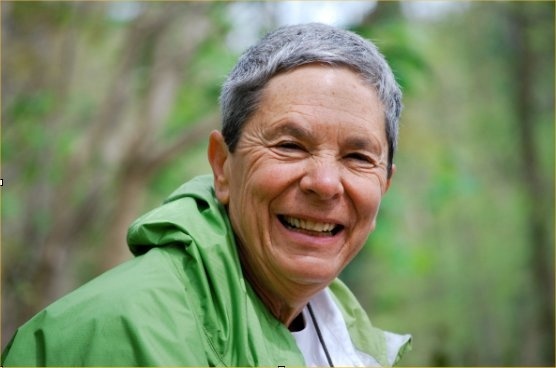 Our support driver – Jean Taylor is fantastic and one of the best supports we have had!! It’s a delight to see her as we round the corner and her car is covered in the Footprints for Peace banner and her mad wave from the car. Thanks to Jean we have now many great supplies for France!!! From Guildford we walked to Haslemere Scout Hall. 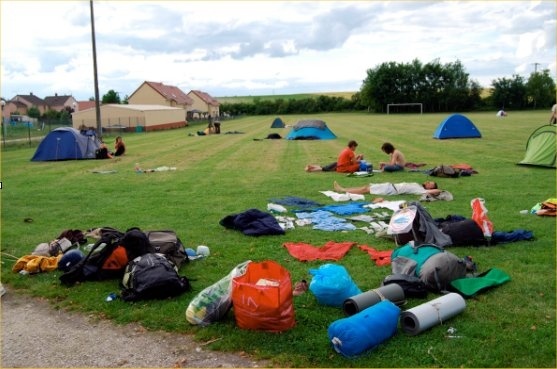 Having spent nearly a month trying to find a stay place for this area – I was completely happy that the scouts allowed us to spend the evening in their well equipped hall!! 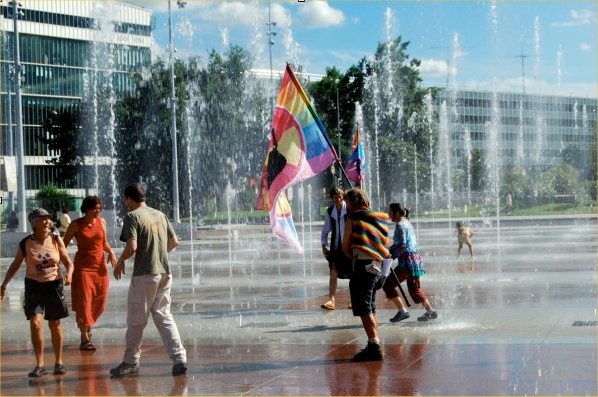 We set up a portable shower for those that wished to wash themselves down – a few taking up the offer!! 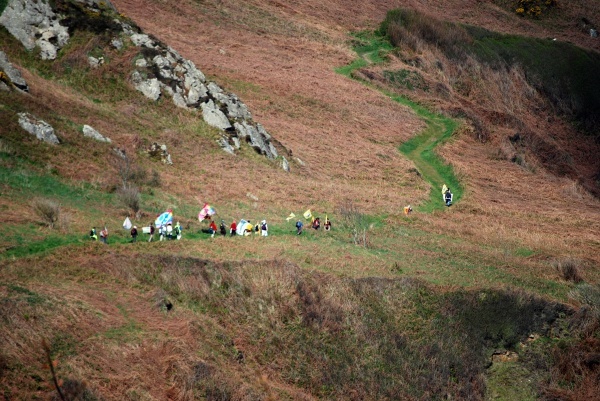 I think a few more walkers could have taken up the offer though?? 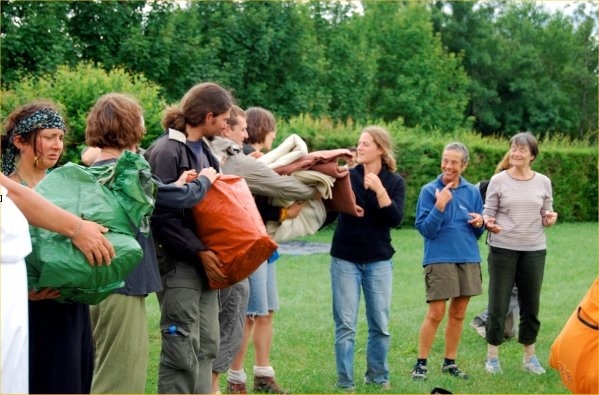 Many walkers chipped in to make a delicious dinner – and as we gradually get to know each other – great skills are being found out each day!! 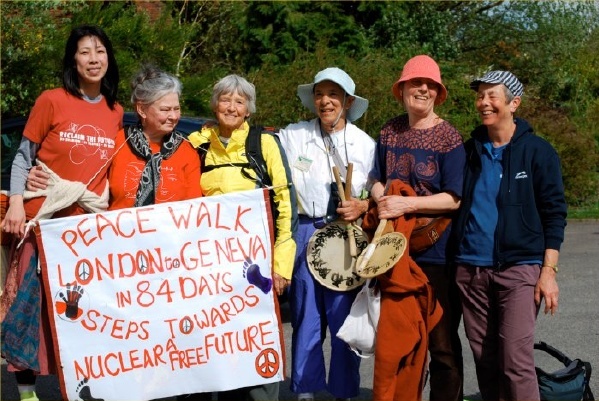 Above left to right are Levi from the Milton Keynes Peace Pagoda, Hattie Nestel a long time walker from the U.S.A. and June from Australia. The road from Haslemere to Petersfield wound beautifully through the forest. It was a great walk!! We were blessed today having missed the rain in the morning before we began walking and then again as we stopped walking in Petersfield the rain fell heavy again. 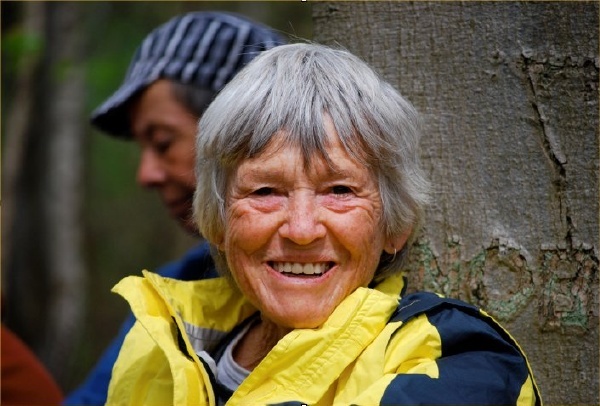 Our first break at Liphook Train Station we were joined by a local women – Ann. 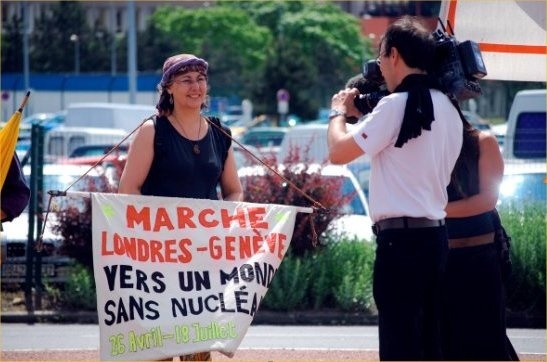 She is a long time anti-nuclear activist and renowned for her sewing circles at the Trident Nuclear Submarine Base. 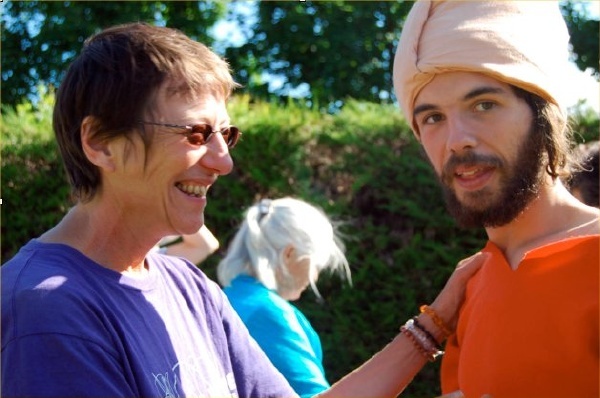 Her deafness did not stop Anne’s enthusiasm and great energy and it was a delight that she could join us for the day. 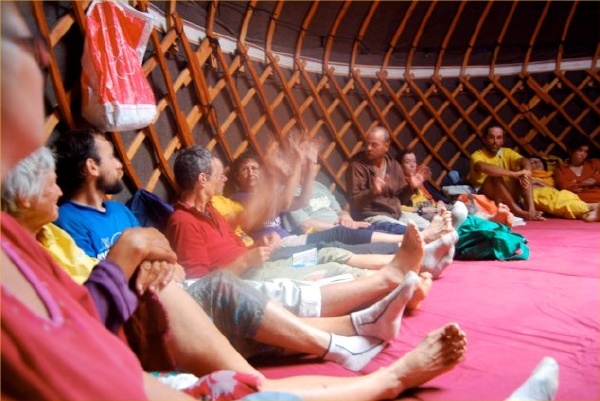 With dry space & hot cuppa’s we all felt glad to be watching the rain from inside. 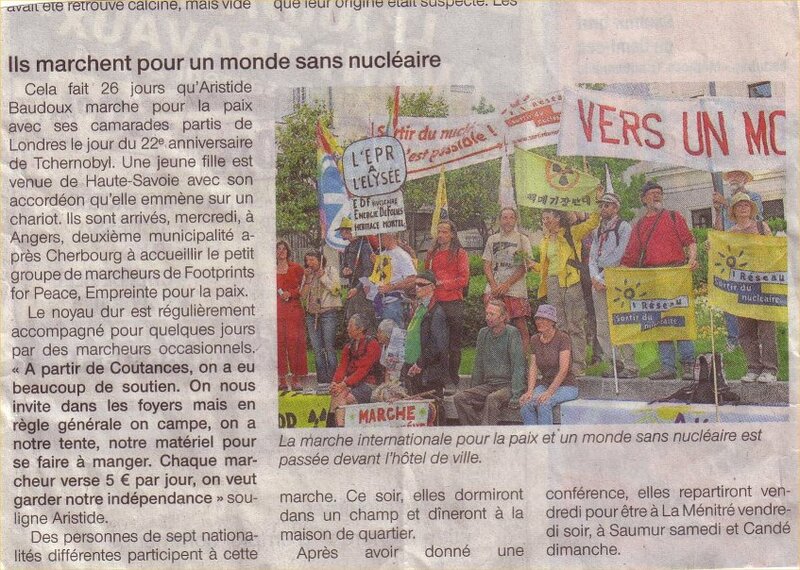 The media joined the walkers and we hope that we have sent a message to the local community about nuclear power and weapons. Even though we had advertised for a public meeting in tonights hall we have really been surprised at the lack of support from local people. Especially along the road we have been so well received with much waving and tooting, however public meetings we have had not much response. 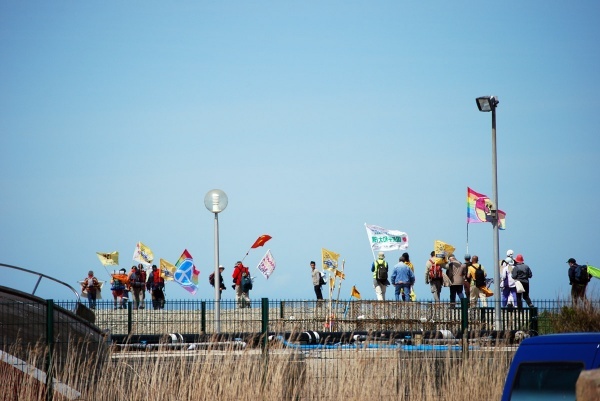 We are surprised that as the UK Government under Gordon Brown, announces more nuclear power plants more people are not speaking out against this move to create a dangerous radioactive legacy. Well, I have sent the walkers off in the rain!! The rain has been falling for about 14 hours now!! And still looks like no ease to the day. A few walkers will be glad for the 4 hour ferry ride to be able to take some rest. The walk today from Petersfield to Portsmouth is our last day in England before we take the ferry tomorrow morning at 8.15am. Another early start will see walkers sleeping I am sure on the Ferry. 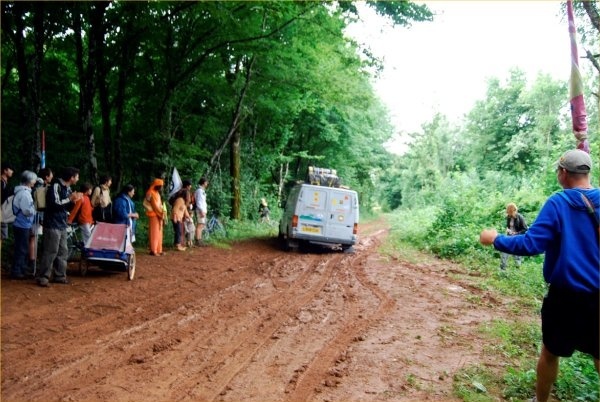 Lets hope for some sunshine in France. An early start for the cross channel ferry from Portsmouth to Cherbourg. We bid a sad farewell at the ferry terminal to our stalwart support driver Jean and to Morgan, who had walked with us from London. The 2 ¾ hour ferry crossing churned one or two stomachs, with Albert feeling particularly rough as he journeyed back to his homeland. We were all energized at the strength of the French as we entered the city centre of Cherbourg when they yelled “take the streets”!!. Swept up by the power of people we were marching in the middle of the main road down the beautiful streets of this harbour town. 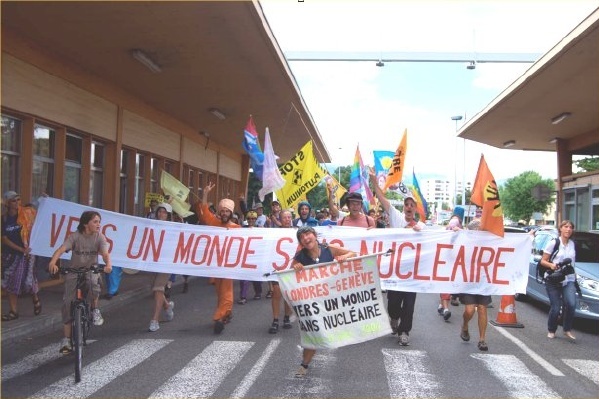 With a flurry of activity and color with our banners held high and a huge banner unrolled across the streets screaming “SORTIR du NUCLEAIRE C’EST POSSIBLE!! We stopped for a press conference at the front gates of L’Arsenal de la Marine – the site of where France builds nuclear submarines. 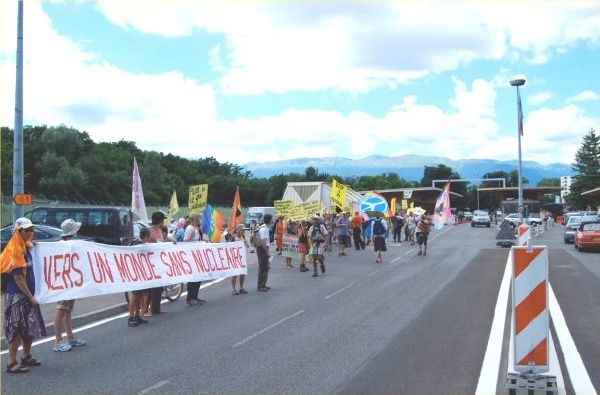 This same site only 2 months ago was visited by the French Government, Nicolas Sarkozy who was promoting the need for France’s security from Iran & North Korea with more nuclear weapons. 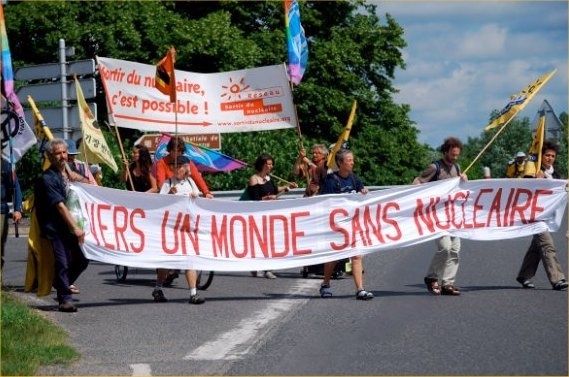 This very first press conference gave the walkers a very clear indication at the full intentions and dangerous situation that France and the rest of the world face with the Sarkozy government pushing for further nuclear technology. We continued along the promenade, splendid in the sunshine, before retreating inland to our first stay place in France, a charming farm near the village of Urville-Nacqueville. 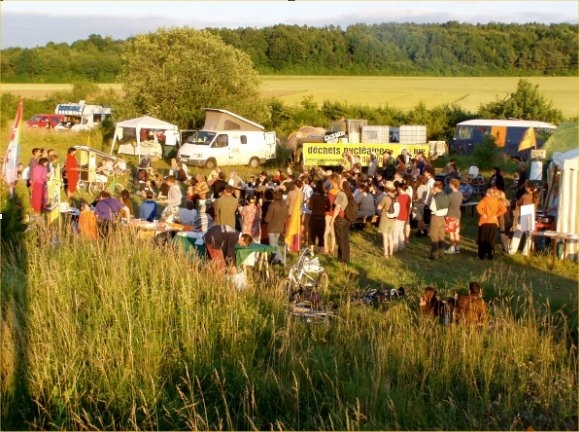 Eating with the cows and camping by the river gave the walkers a warm welcome to France. Later that night, we were joined by more new walkers, Sylvain and Contain. A new country, a new language, a new lifestyle to get used to. Everything seems to be happening so quickly. Exciting but challenging days lie ahead. Our simple coastal path along the Cherbourg Peninsula is one of the most beautiful places I have seen in the world. It is also hard to believe that we are in one of the most deadliest places in the world!! 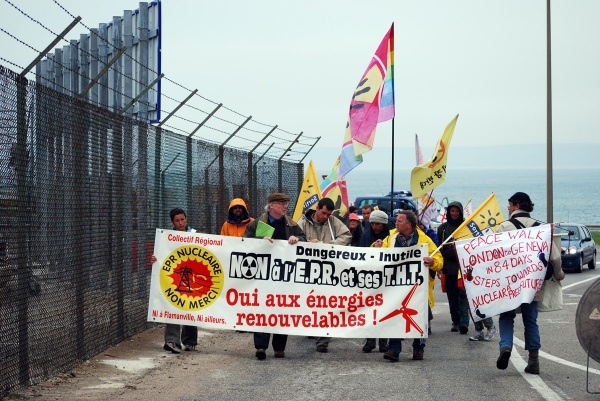 The looming distant site of Areva’s Reprocessing Center at La Hague on the Normandy Coast was a constant reminder of the massive risk that place, people and land face. 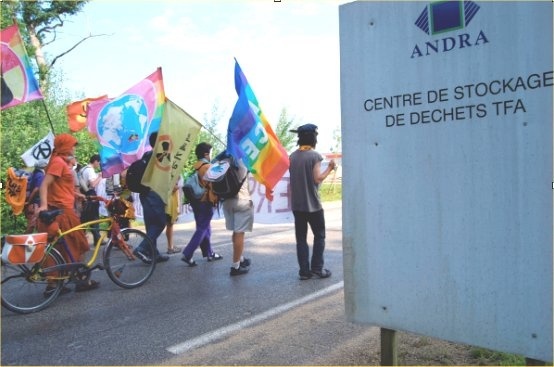 This site is used for reprocessing most of France’s uranium spent fuel. 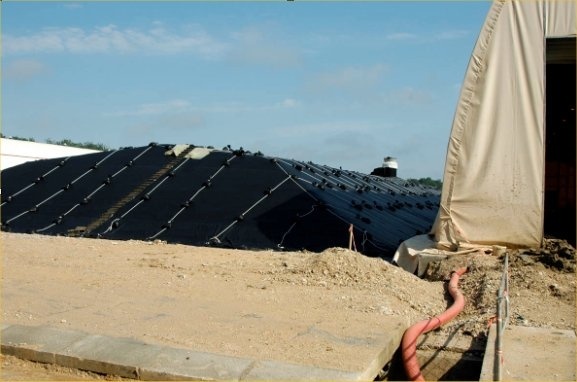 There are 2 reprocessing units here – one for reprocessing domestic spent fuel and the other for foreign spent fuel – including Australia’s waste. 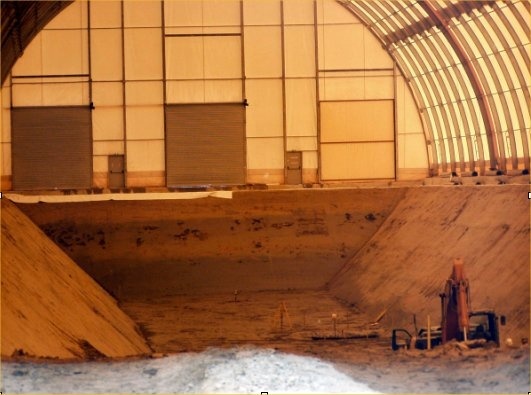 The site also stores highly radioactive liquid waste arising from reprocessing and highly radioactive glass logs that result from mixing the high level liquid with molten glass. 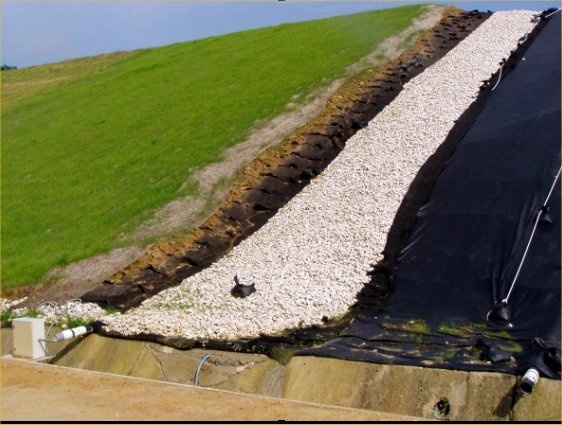 The waste generated by reprocessing is pumped using a pipeline to discharge hundreds of millions of litres of liquid radioactive waste into the English Channel each year – polluting the oceans all the way to the Artic. 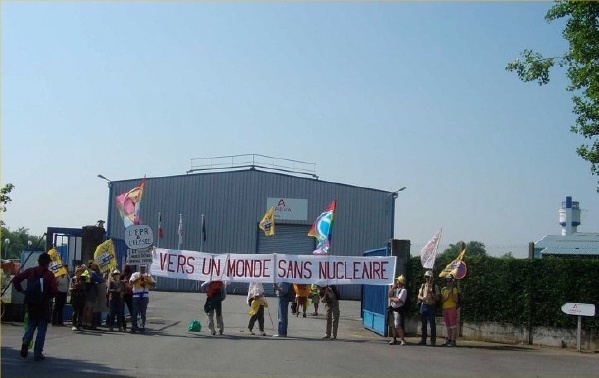 We demonstrated at the front gates of Areva with much people & color, adding an impressive view was the huge banner across the gate declaring: “NON A LA PLUTONIUM-CONNECTION”. 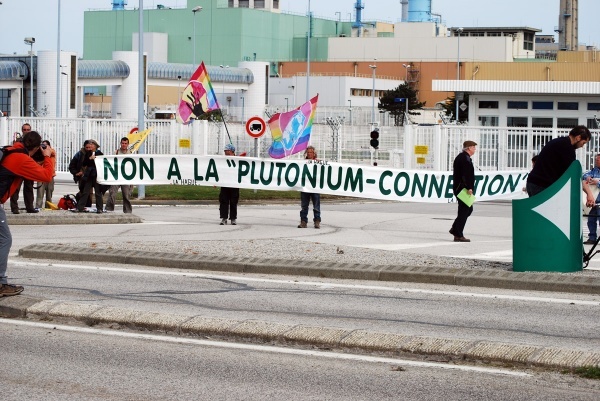 “France reprocesses its spent nuclear fuel to recover the plutonium which it makes into mixed oxide fuel – a mixture of plutonium dioxide and depleted uranium dioxide called MOX fuel. 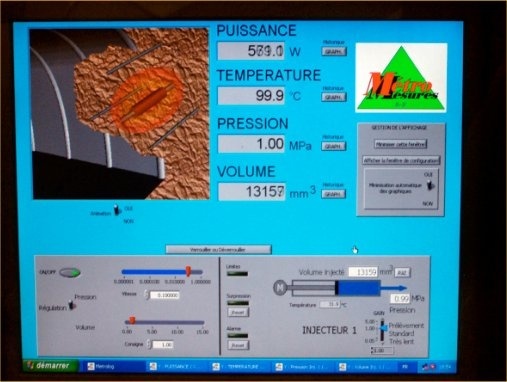 This supplies 30% of the fuel for 20 of France’s 58 reactors”. 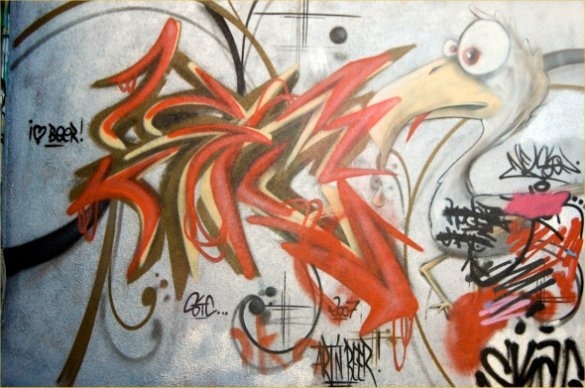 By Didier Anger. 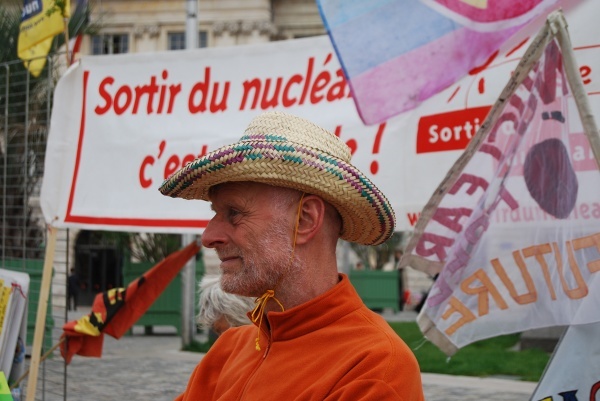 Didier Anger – a very long time anti nuclear activist with an incredible amount of knowledge on the nuclear situation in France spoke to the group about the dangers of La Hague. 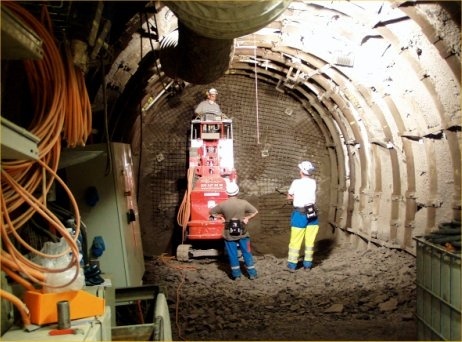 The reprocessing at La Hague has created large quantities of solid waste contaminated with plutonium. 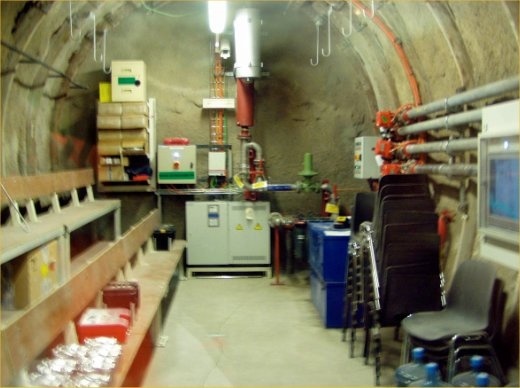 As of 2005, most of the plutonium extracted through this reprocessing contributes to the 80 metric tons of surplus plutonium at La Hague, stored in hundreds of vulnerable containers under ground. Didier spoke of the accident and security risk this site poses because of the tens of thousands containers stored here with plutonium & the liquid high level waste tanks. 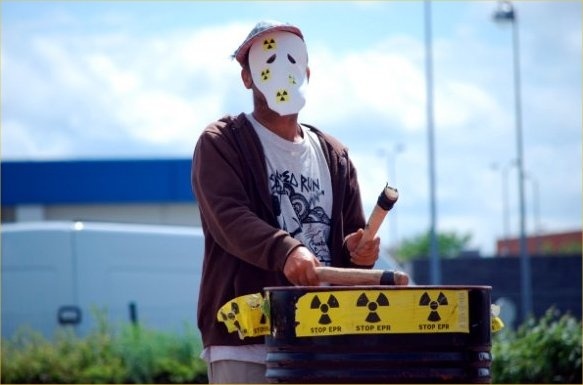 Areva also releases all of its radioactive carbon-14 into the air, identified by the French Nuclear Safety Center as the isotope in reprocessing discharges that is most damaging to human health. The routinely radioactive gases released by Areva, including krypton-85 are at levels 1000 times higher than natural radiation levels. 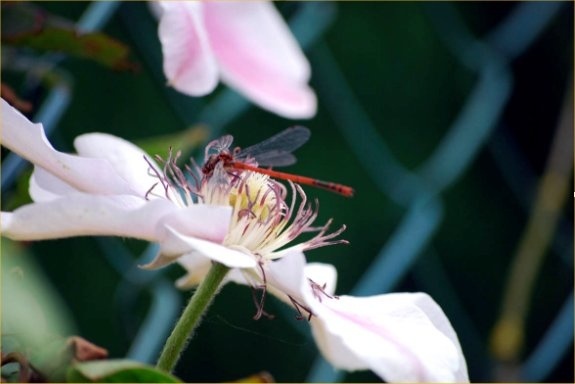 With little police presence made me feel a little less nervous however I soon realized that the security of the site was heavily guarded with massive amounts of barbed wire and electric fences. It would be really hard to get into this site!! Reprocessing Centre in England. This site is another reminder to me that every step of the fuel chain contains potential disasters to human and planetary health. 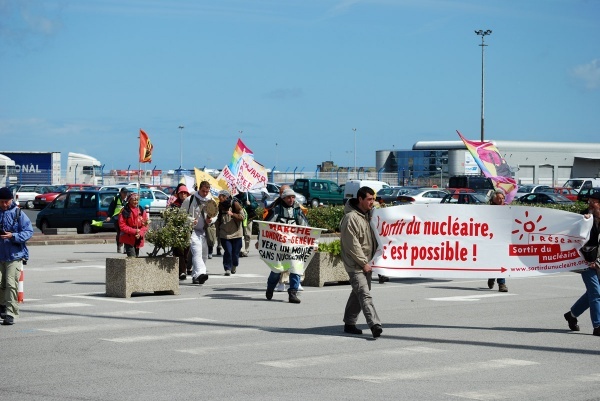 Walking up to La Hague you can see the site of Flammanville Nuclear Power Station. So between the beautiful coasts you have on one side Areva, and on the other Flammanville. We lunched this day in between the 2 deadly sites on a beautiful beach – non-one daring to swim in the contaminated waters. On a grey and overcast day we packed up our tents and walked to Flammanville Nuclear Power Plant. 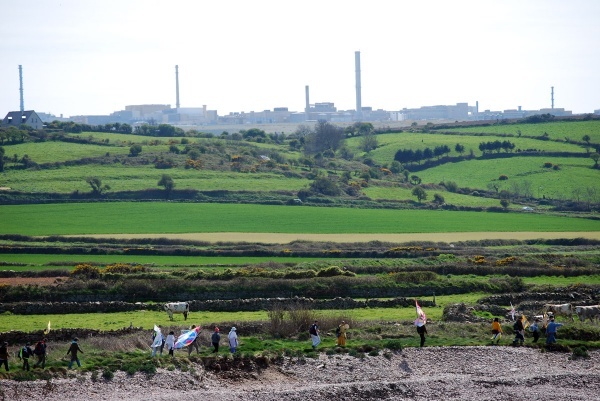 We were completely grateful for our overnight stay places over the last 4 days in this area as we knew that most of the people working in this area supported the nuclear industry – it was their livelihoods. At Flammanville , the walkers were again joined by Didier Anger, and many journalist came to hear our stories. 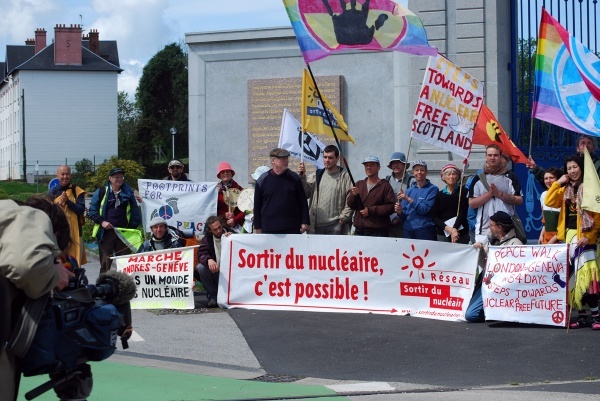 We were also really happy to be joined by a few local people who live nearby to the nuclear power plant. If ever an accident in this beautiful place these people & life surrounding would suffer just like Chernobyl. 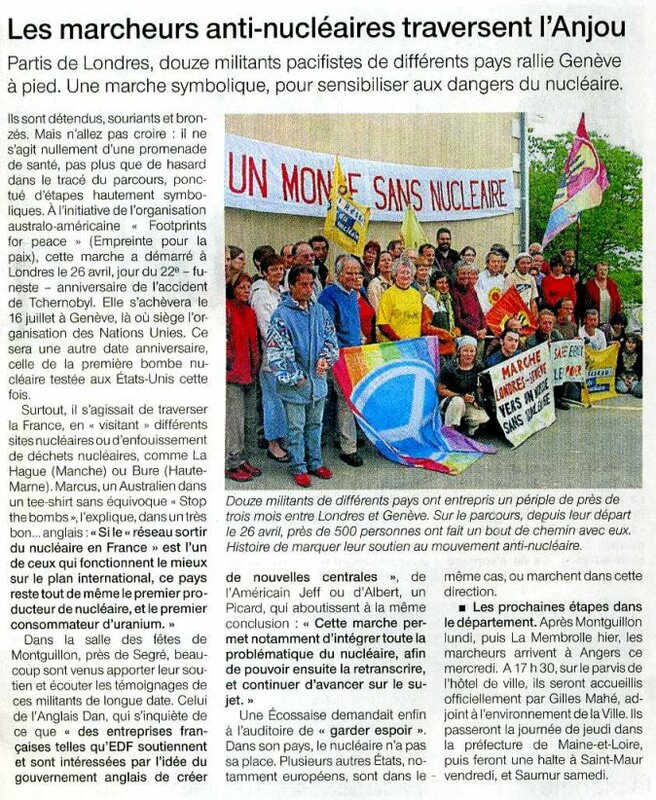 Against strong opposition in the 1970’s 2 reactors were built in Flammanville. 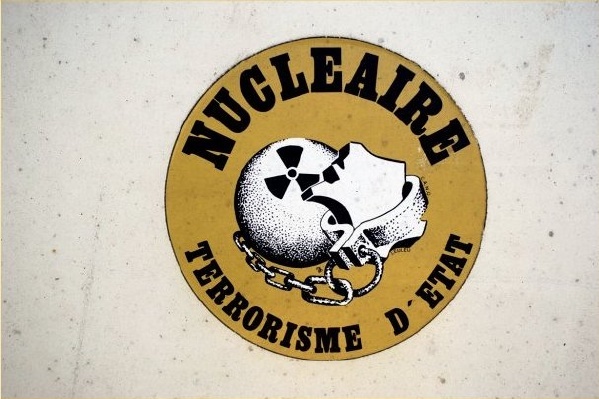 France made the decision to go massively for nuclear power in 1973. 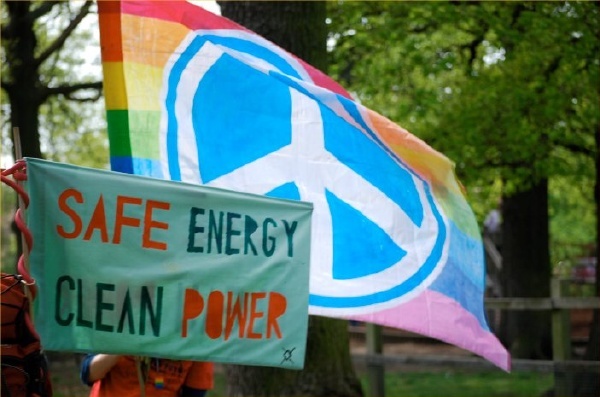 The opposition to nuclear power was largely overridden with rhetoric of energy independence. But in fact France imports all of its uranium. 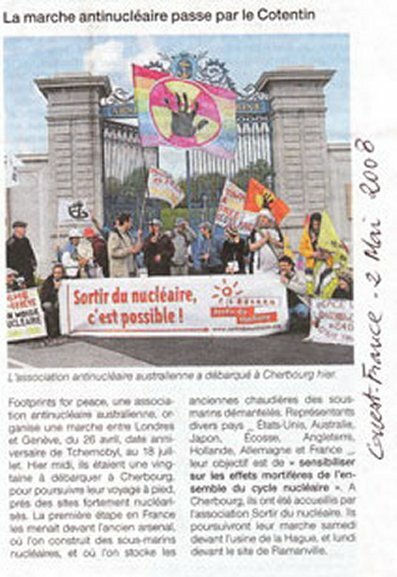 France is the 3rd highest importer of Australia’s uranium. 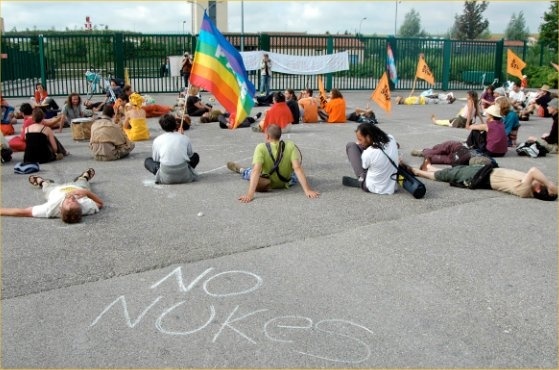 France’s less than adequate public checks on the massive nuclear expansion was made much easier by the fact that it had just one electric utility – Electricite de France (EdF) – that was 100% government owned. Today EdF is over 80% government owned!! 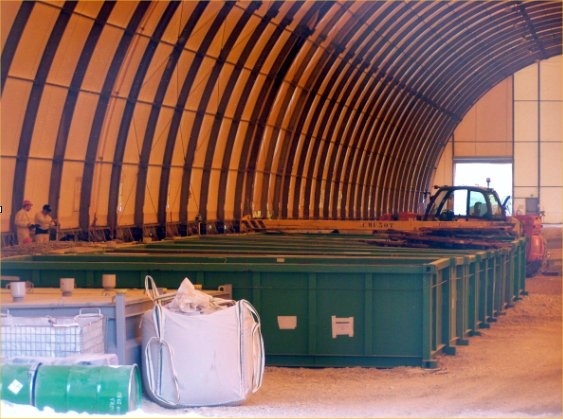 Cogema – the reprocessing company was also 100% government owned. 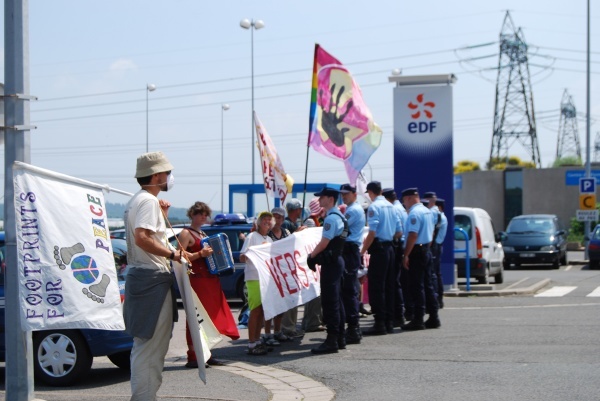 Today EdF is part of the conglomerate AREVA – which is more than 80% French Government owned. Today there is a new project to build the third nuclear reactor - the European Pressurised Reactor, or EPR. 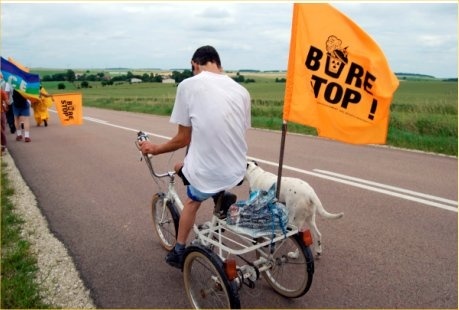 But as told by Didier its not European it is just AREVA- France. 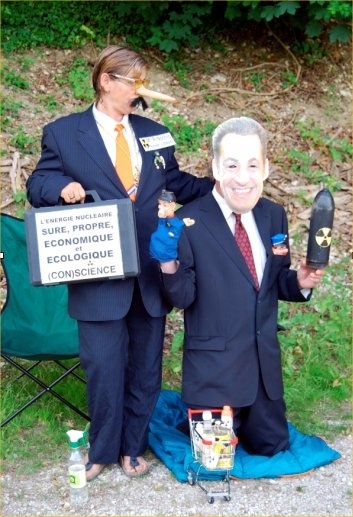 The Sarkozy Government and president of Areva has toured the world promoting nuclear power, as AREVA want to be number 1 in selling nuclear technology!! 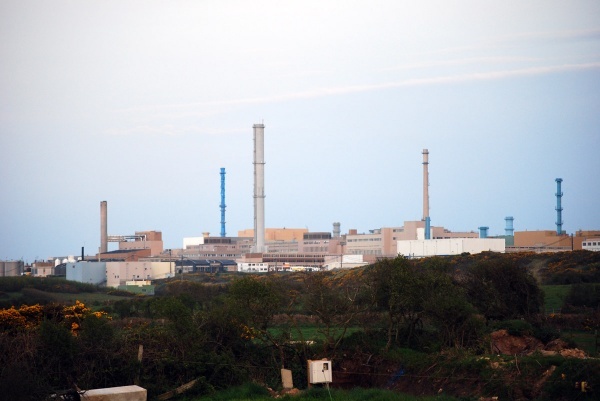 They decided Flammanville to be the best place for the power plant due to the proximity to the sea rather than the river – as the rivers are now facing problems with the water levels. The second reason was that the fences from the old coal mine existed and they could use this for the power plant and work with the police to protect the site. 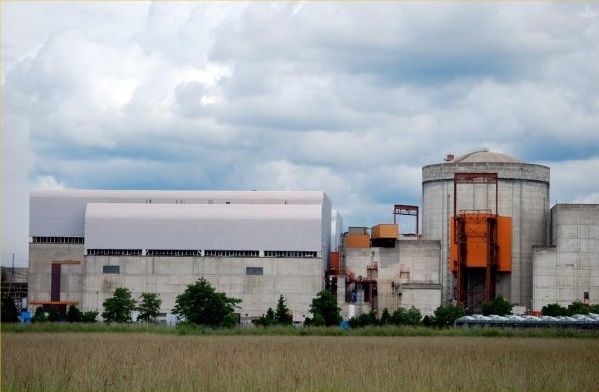 This 3rd reactor will transport electricity for 300 kilometers and this will need the construction of THT Lines. Over 100 local groups are opposing these lines as an action against the building of the EPR. So the opposition is not only for the closing of the EPR but also not to build the THT lines 50, 100, 150 kilometers away!! This is really important part of the campaign to raise awareness of the distance the electricity has to travel to reach people & imposing added costs on ratepayers & taxpayers!! Instead of having local renewable energy like solar & wind for less cost to the local community and environment globally. Why do they always seem to site these monstrosities in such beautiful areas?. Making our way down south through Normandy, we had a lovely rest day at a farm at Le Vretot, where our hosts catered for our every need, including installing a solar shower & sink, composting toilets and doing all our laundry for us. It was really hard to leave this place as we had such a great rest day with lots of music, dance, food and laughter!! Here we bid farewell to Heidrun from Germany and welcomed new walker James from the US. The day after the rest day, we were accompanied by young Benjamin, the son of our previous hosts, who walked with us all day to Doville. 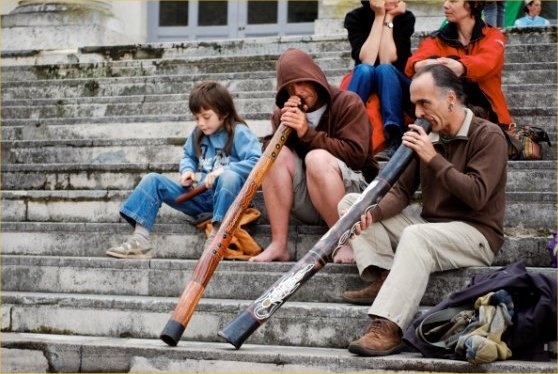 Both families farewelled us by playing Amazing Grace on the saxophone & penny whistle….oh so nice as we walked off into the beautiful forested road. After a pleasant stay on a campsite by the beach at Anneville-sur-Mer, where we were joined by Red Marion (on her birthday) and her bicycle, and other walkers and rejoined by Jocelyn. After days of walking through very peaceful and beautiful countryside, we finally arrived at the town of Coutances: back in civilization at last! We had the luxury of staying in a gymnasium with showers on this night much to the delight of all the walkers. 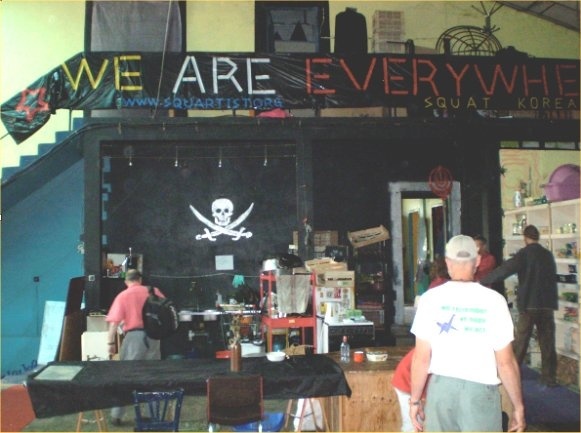 Due to the weekend we had many many people join us to walk into Granville and as we were accompanied by 3 women accordion players the spirit and energy of the walk quickly rose. Walking down through the old streets of Granville to the sound of the accordions and people singing into the rich area of the Yacht Club we managed to raise many eyebrows and hand out lots of street flyers. 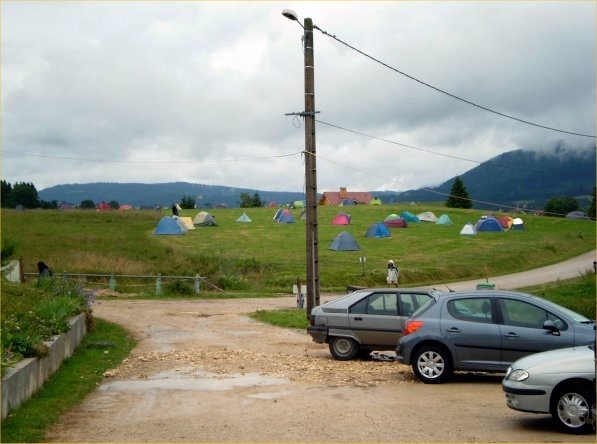 Our rest night was in people’s private homes where walkers could experience real personal French life and enjoy showers and washing was a treat. Thank you to all the organizers and hosts for this special night. 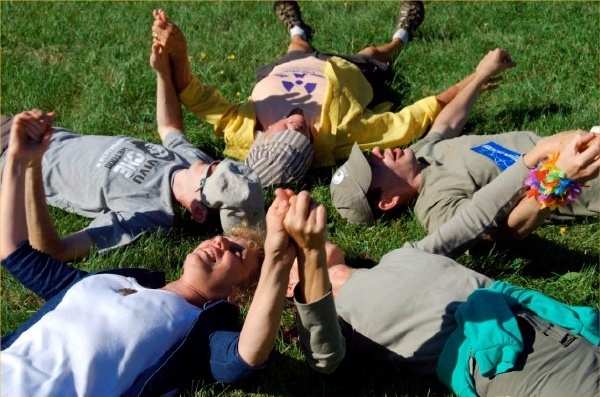 In the morning the group rejoined in high spirits after spending a night away from each other. Hearing Aristide, a beautiful rainbow character rejoice as he sang out “ ah my family again!” was a joyful and happy sound as each person hugged each other!! Still along the coast we again walked along the shores of the ocean from Granville to Avranches. We are beginning to go inland again away from the salt air and ocean sounds. In Fougeres on the 15th May we visited the Statue for Life before walking into the centre of the old town. The statue of life was made in response to so many statues in this area dedicated to war and those heroes of war. This is a beautiful earth statue surrounded by water and images drawn by children from all over the world. This evening we had a public meeting in the square and we were told that the Department Authority in this area had said NO to wind farms. 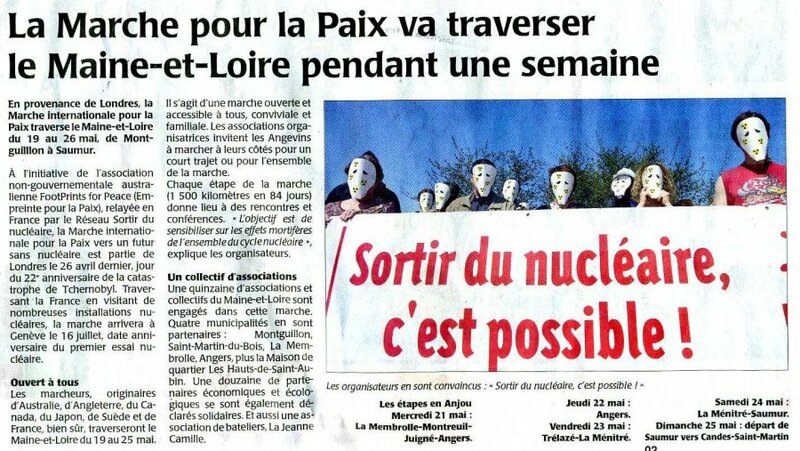 This is because the Sarkosy Governent has ordered more money towards nuclear development. All these Departments are under the control of the current government and have no real power. The THT line is chosen now for this area and it goes across 5 villages. 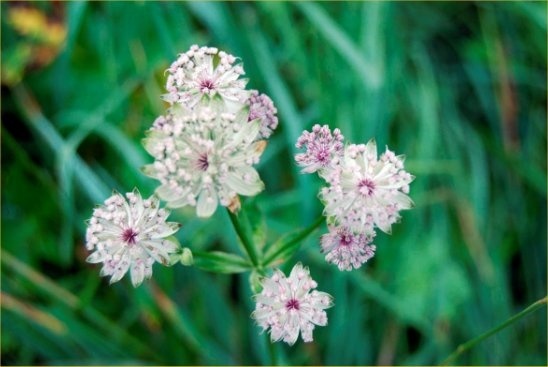 Most people are becoming more and more against the THT because it is a negative factor for the health of people. There has been independant studies on the effects of these THT lines and these studies show a higher level of cancers & leukemia’s in people living close to the lines. But the government ignores these studies saying “that they are not important & if people become sick then they will get treatment”. Many local people including the council & department members are very angry at this response. This last week we have just been so busy with so much support, public meetings, media, music and ongoing cake & coffee stops supplied by the local communities. We are walking along some of the proposed site of the THT line and there is so much opposition to this that the support for the walk has been overwhelming. 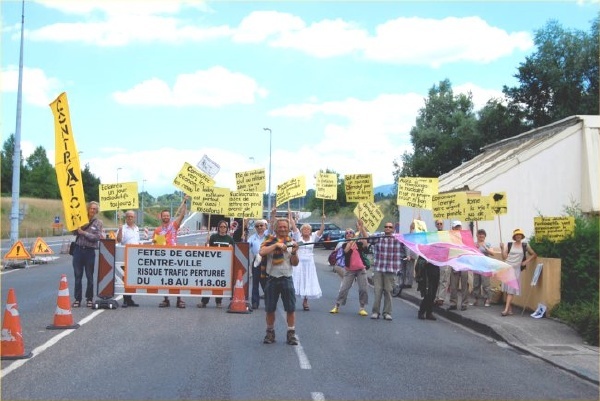 Again the government proposes to put the THT lines in some of the poorest areas of France and some of the remote areas we there is little resistance from the people. 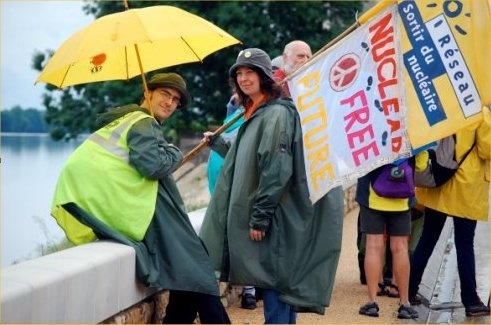 For us these people who are supporting the walk and also resisting the nuclear industry are incredibly courageous and strong and give each of us such inspiration. Its been fanastic to connect with these people and listen to their stories. 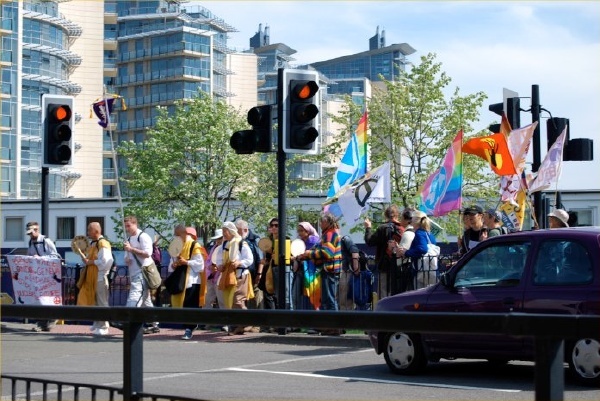 On days were we seem like there is not so much support all of a sudden we are joined at the side of the road with banners, flags and loads of people of all ages who walked into their local towns with us. 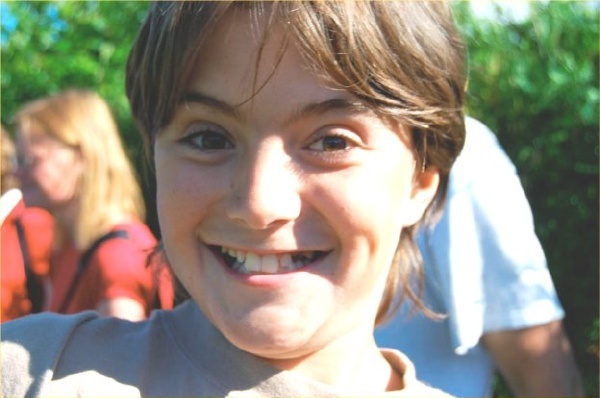 Its great how many children are joining us on this walk!! 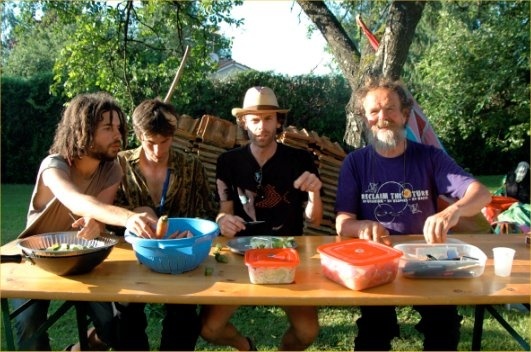 We are then shown incredible hospitality by the local people often with music & song – but the food is just amazing. Juvigne we were amazed at the set up outside the local gymnasium of this small town. They just kept bringing in boxes and crates of food. 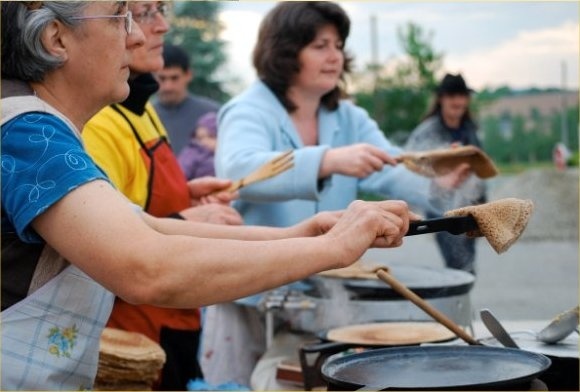 They set up a gas & wood fired ovens and stoves for us to taste the local Brittany affair of crepes!! WOW!! This was incredible. 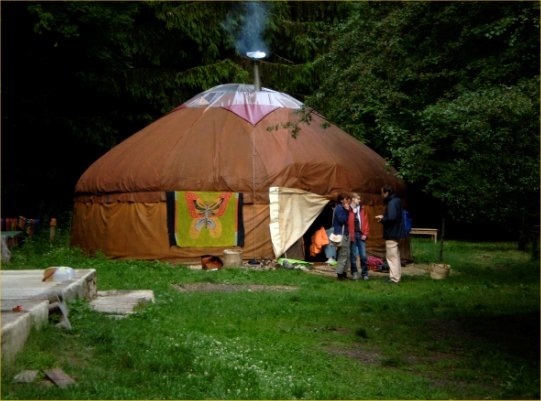 Then the following day to Loiron at each stop a different local person would show up with café (coffee), tea and of course local apple juice and many variety of cakes!! We are all getting a little worried about our weight as we roll along to the next food stop. 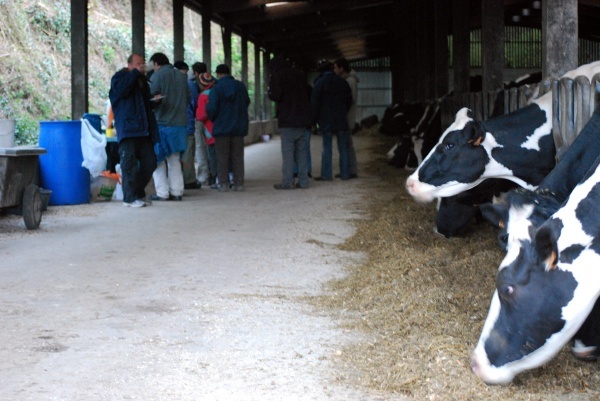 We ask ourselves are we really on a walk, or a food tasting saunter through France? 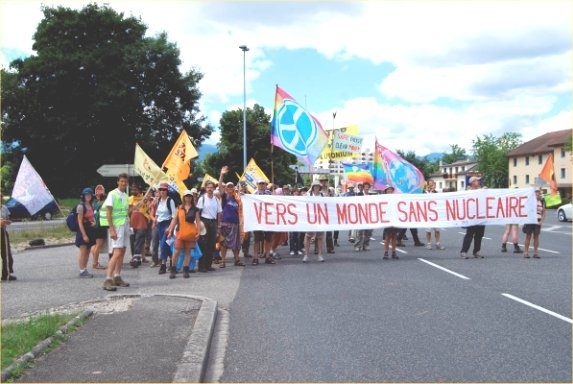 In Montguillon on the Monday May 19th we walked into the small town and were greeted by so many people with the banner “VERS UN MONDE SANS NUCLEAIRE” translation: TOWARD ONE WORLD WITHOUT NUCLEAR, and so much cheering and smiling faces. WOW what a community. 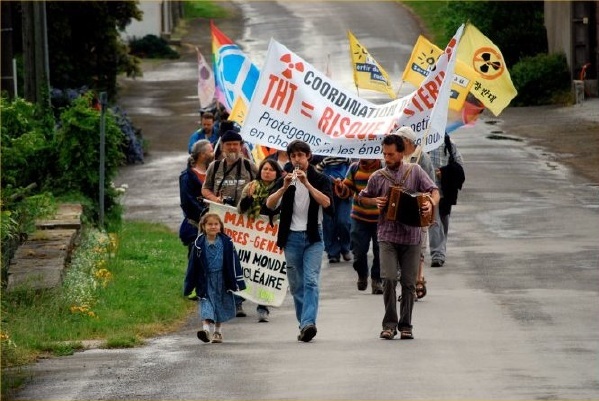 We quickly heard about their resistance in 1979 to the governments proposal of a radioactive waste dump. The mayor welcomed us with words of encouragement and stories of hope. 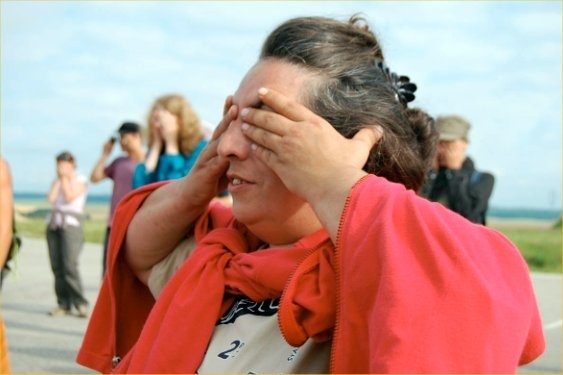 Two things she said I connected with immediately and that was when she spoke of Montguillon as being a place where they bring the local people together through festivals and gatherings in this area to make stronger community. 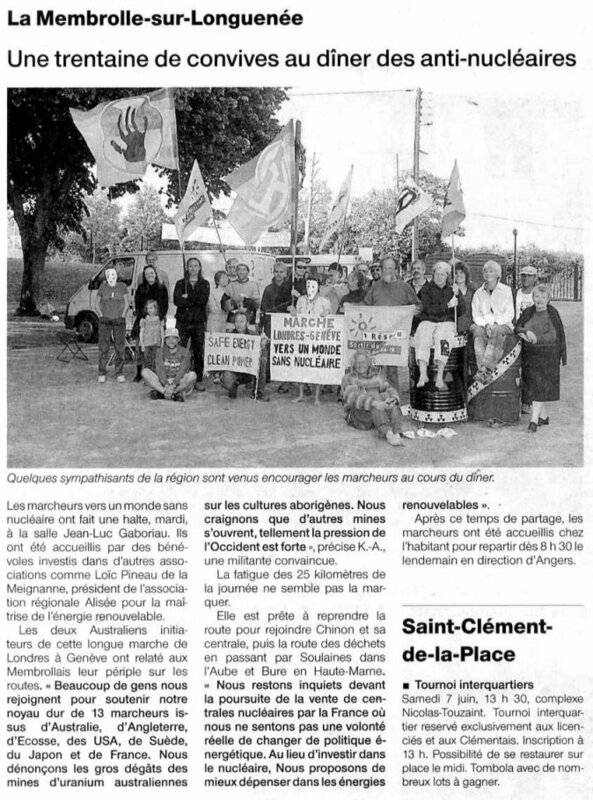 Secondly that our coming here was important because 18 years ago this place was chosen for a waste dump from La Hague. This waste of plutonium will last 1 million years and political people were seduced by this proposal because of the money. 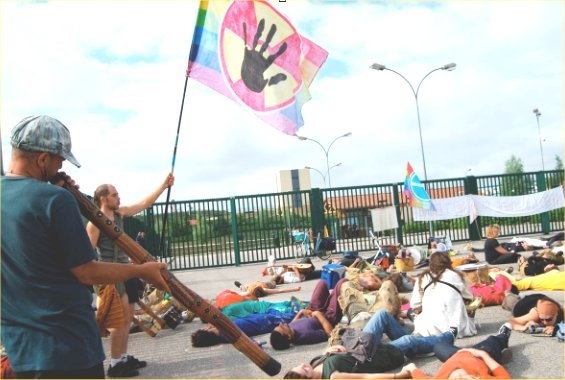 But due to the agricultural area local people resisted. 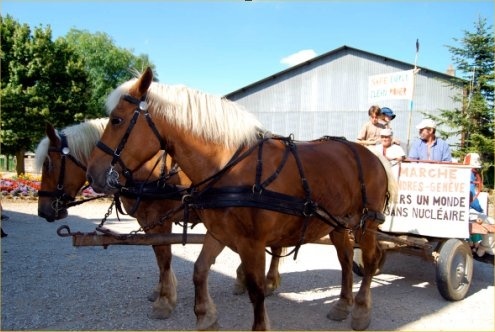 Through their strong resistance of lying on the road to block construction trucks, burning tyres & cars, dumping tons of horse manure in front of the Department Offices – the government had no choice to look what was going on. 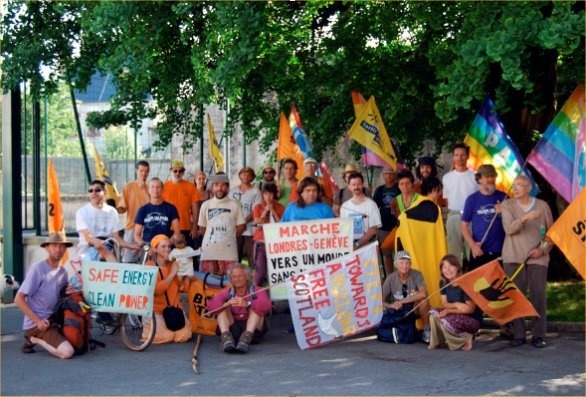 What the local people wanted was for the government to think about the nuclear industry and especially the waste to rethink about the future energy program. But instead what happened was that the government moved the waste dump to another remote area – 500 kilometers away called Bure. 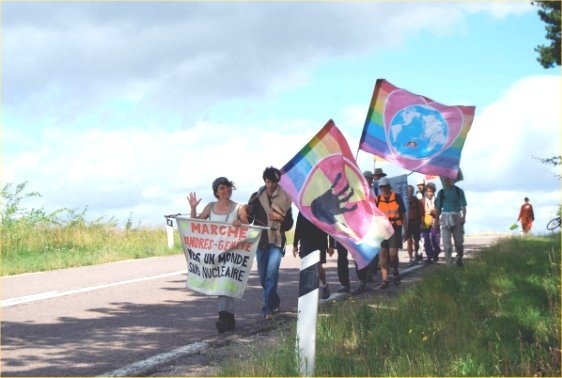 We are walking to Bure to hear more about the waste dump and to be in solidarity with the local resistance. 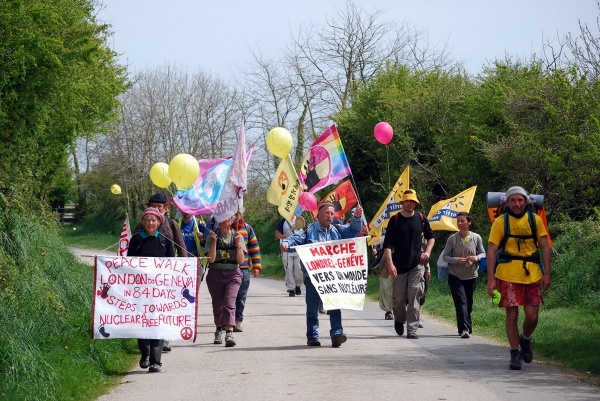 As one local person mentioned that this walk has been important to work together and raise awareness about the whole nuclear industry especially the waste that many people forget this problem of radioactive waste. Our walk to Angers today was marked by the visit to one of the many buildings of AREVA. Here Areva make the canisters that hold the fuel rods needed for the nuclear power plants. We spent about an hour talking and asking many questions to the head of the plant, who surprisingly came out to meet the walkers. One of the questions he refused to answer was where AREVA sourced the zurconium needed to make the canisters. I found out latter that 80% of zircon mining occurs in Australia and South Africa. 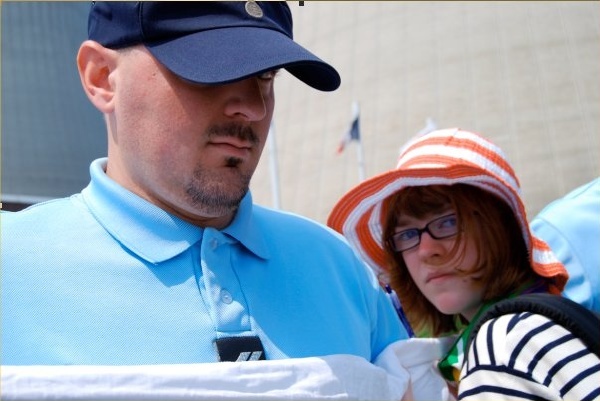 After many attempts, Marcus Atkinson from the UK was refused entry into AREVA to hand out flyers to the employees. 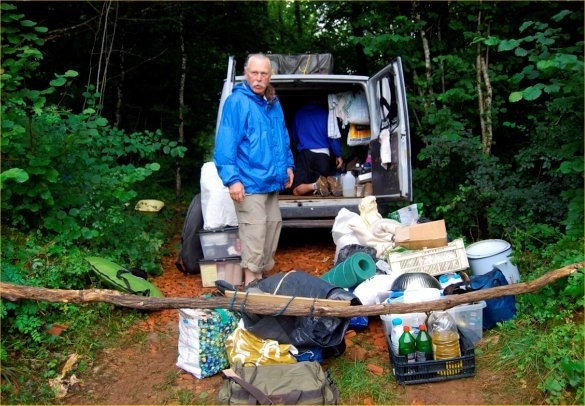 He did succeed in putting the flyers onto parked cars, and cars leaving & entering the site. 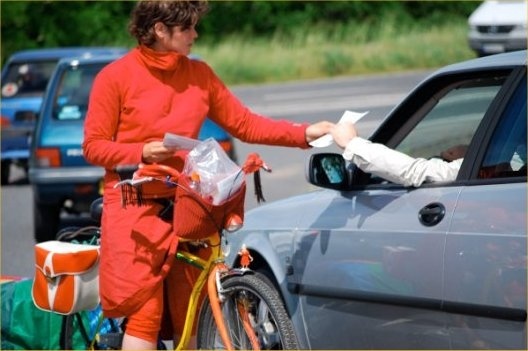 We have all been surprised at the amount of flyers we are handing out as people, especially workers happily accept the information given to them and want to find out what we are doing. 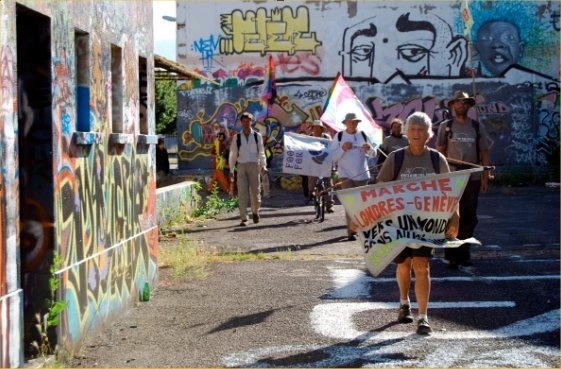 We were greeted by many local people & media as we walked to the Mayors’ Office of Anger. Unfortunately he was unable to see us however the Environmental Representative from the Office came and spoke to the walkers over coffee and biscuits. 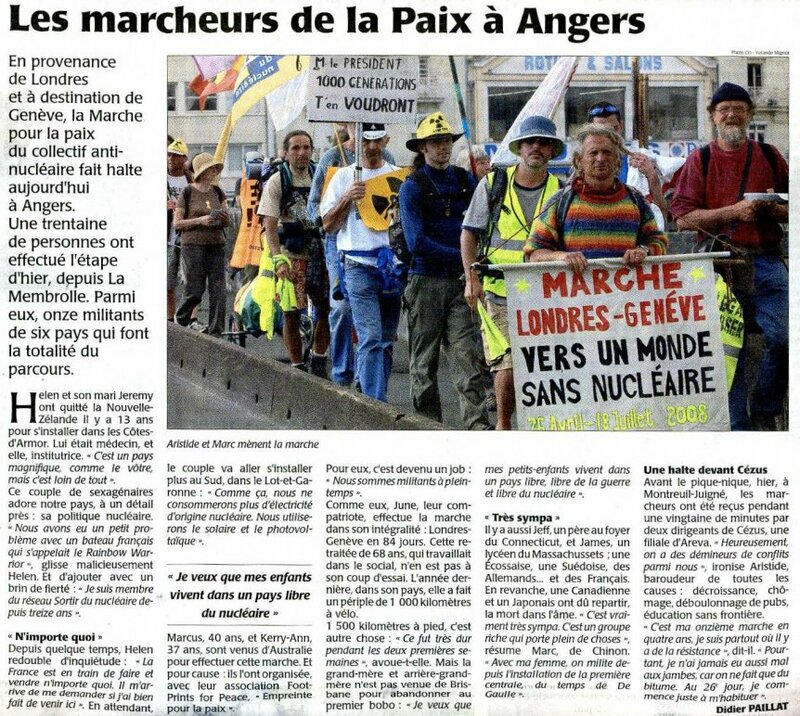 He told us that Angers is part of Mayors for Peace and that the area was trying to become more green and use alternative energy. Hoorray!! 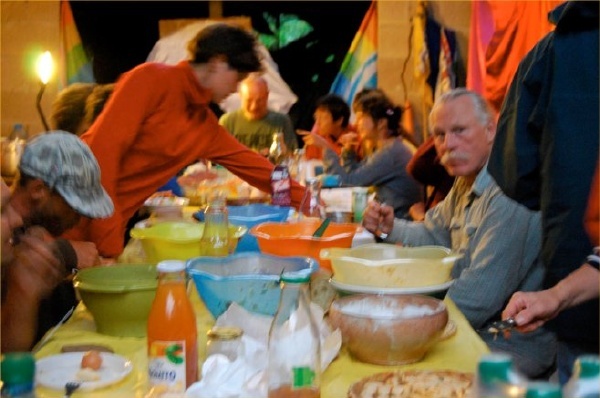 The local anti-nuclear group of Anger was a young group of people with families who cooked for us this evening a delicious soup, with bread and of course followed by fromage (cheese). The food is wonderful and none of the walkers are complaining about the lack of local specialities to taste!! Our rest day was filled with not only rest but a public meeting in the evening attended by about 60 people. The most interesting part of the evening was the talk given by Aghali Mahiya from Niger about the uranium situation in Northern Niger – the third uranium exporter in the world. 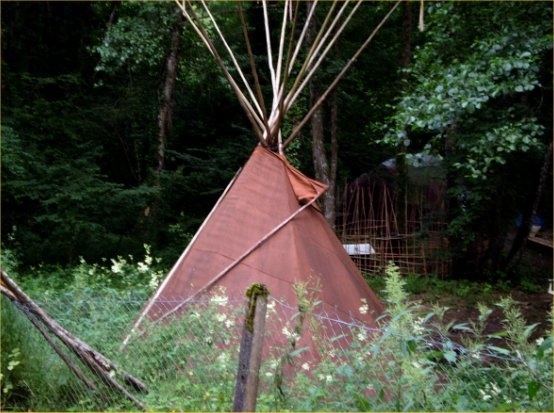 Aghali Mahiya is seeking asylum in France because of the terrible situation to his people and land. Aghali is a Tuareg, originally wandering Berber people whose population is unequally spread over the territories of Niger, Mali, Algeria, Libya and Burkina. 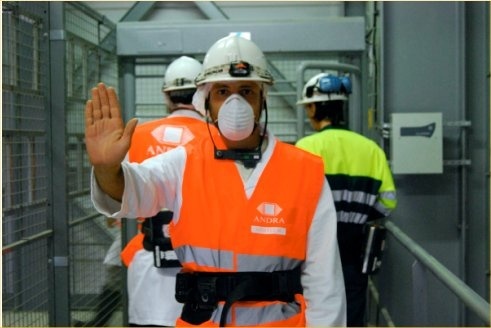 For 40 years AREVA have been working in a mine near Arlit., under the name of 2 sub companies, SOMAIR and COMINAK. 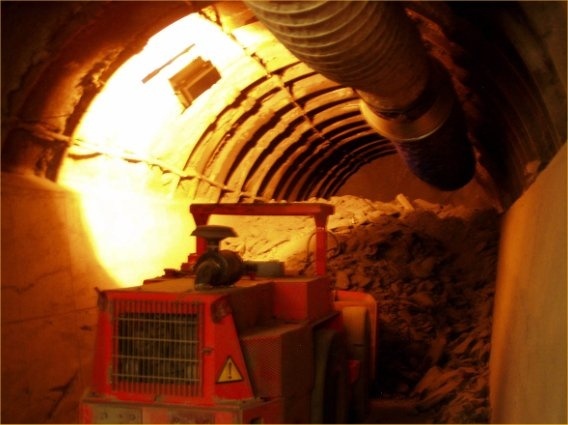 A coal mine has been opened up about 190kms south of Arlit in order to supply the 2 uranium works and supply the towns with required electricity. 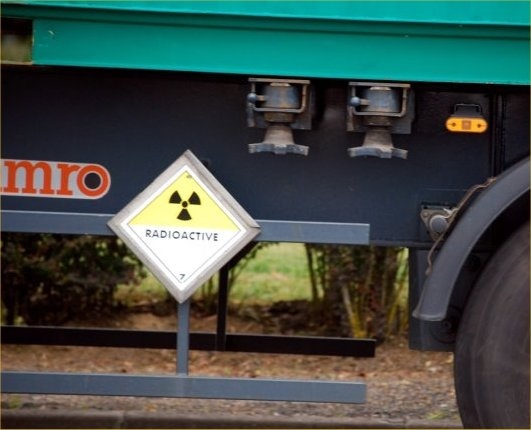 In 2007, 139 uranium research licences were approved by the Nigerian government to European, Asiatic, Northern American and Australian companies – in the heart of the natives area of moving flocks. 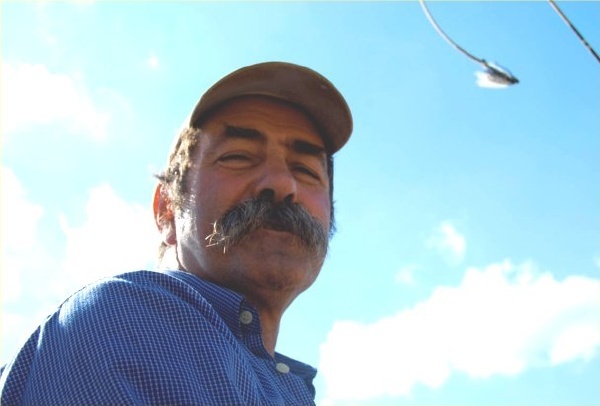 Those licences were allowed without consulting in any way the local populations and obviously consequences were felt by everyone: loss of land, pastures and wells – in other words, their means of living!! There are two Australian companies – Uranium International Ltd & Rio Tinto who have been given land to mine uranium on Tuareg pasture lands. By allowing 130 uranium research licences the Nigerian Government are opening the doors to a sanitary, humanitarian and environmental disaster!! For decades the Northern Niger populations have been economically and politically left aside and have been suffering from famines once again; in addition they now have the “unfortunate luck” of being born on rich mining grounds and it is this wealth that forces them to leave. Similar to Australia, the Tuaregs like the Bushmen in Kalahari, the Ijaws in the Niger Delta and so many others, lost their control on their ancestral lands and are fighting to get them back. Facing the same situation in Australia is the water issue. For thousand years, the Neolithic wandering population used to go to the huge Irhazer plain where they ised to take their flocks to graze along the laid out by wells and springs paths. Still nowadays, their herds and flocks use to be watered by the wells and springs which pipe the Agadez sandstones water-bearing stratum. This area is very important for animals in whole Niger. The Agadez sandstone water bearing stratum, is the only water resource in this area – it is fossil. Since the beginning of the uranium mining, the water-level has been becoming inexorably empty. 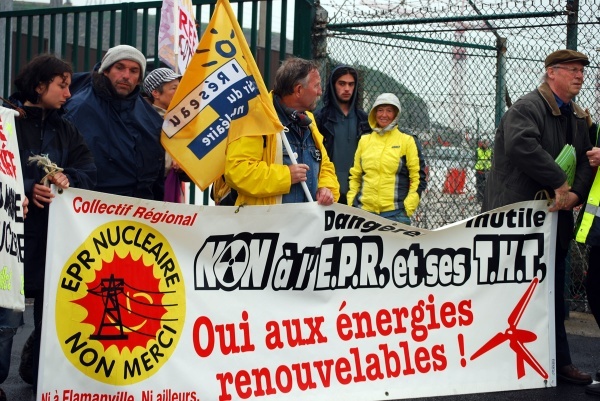 “20,000 m3 a day have been planned by the COGEMA for AREVA’s new uranium mine in Imouraren”. In Arlit the uranium mining companies have already used 70% of the water bearing stratum by piping 22 000m3 a day for 38 years and they are so lacking in water resource that they plan to use a 30km long pipeline to extract water from the Agadez sandstone water level!! Aghali commented that as “25 million m3 of water are currently yearly piped it is not easy to work out that the Agadez sandstone water level will be totally empty within 40 years from now”. And with the speeding up of the delivery of uranium mining licences this could be even quicker!! But as he said, “mining companies do not worry about this predicated disaster because uranium deposits will have been exhausted too and the area won’t be of any more interest for them and their shareholders”. WOW what a beautiful place!! No wonder they tell us that the kings of France built incredible castles in this area next to the Loire River because of the beauty. This royal river lives up to its reputation as a world heritage site!! 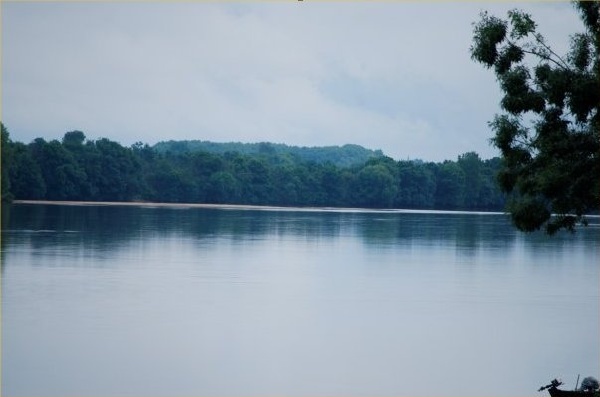 This morning we took a boat ride for 4 kilometers along the Loire and saw with such peace the beauty of islands, sandbanks, bird sanctuaries amongst the trees, flora and fauna in abundance. It was another way of seeing such spectacular sacredness. The rain didn’t dampen our rich experience on the Loire. However learning about the effects of the nuclear industry was devastating. To be riding in a boat, along the river in such tranquility and then listen to the stories of destruction saddens my heart. Why? We ask. Why is this industry creating such suffering and devastation to the people and land. 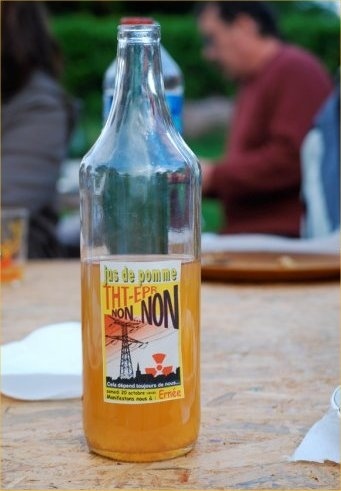 The captain of the boat says that the fish & birds have been effected by the temperature of the water rising due to the radioactive waste water of Chinon Nuclear Power Plant piping it back into the Loire River. The river has an interesting history and has played an important role over the decades to many people living in this area. 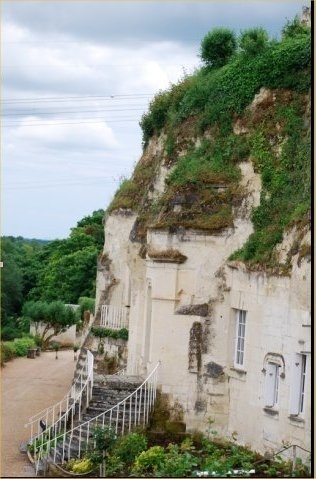 Along the banks of the river you can see the Troglodyte dwellings made from the extraordinary underground caves. These caves were made from the mining of sandstone. Over time people began to live in these already made caves and made beautiful homes during the late Middle Ages that still stand proud today. We walked in the rain for the first part of the day, only after lunch did the rain stop as we entered into the large town of Saumur. We could see & feel that the history of mushroom growing in these sandstone caves would have been perfect because of such humid and damp weather. Today the big manufacturing companies have moved to different countries and this area has lost and important part of its delicious cuisine. 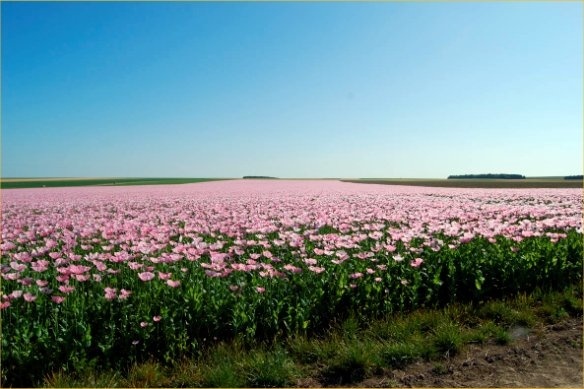 Two types of mushrooms are famous from this area – the pink and white mushrooms. Walking through this area reminded me of walking through Japan – very very similar climate and land we are walking through and to know that we are only 20 kilometers from a huge nuclear power plant makes it even more similar. 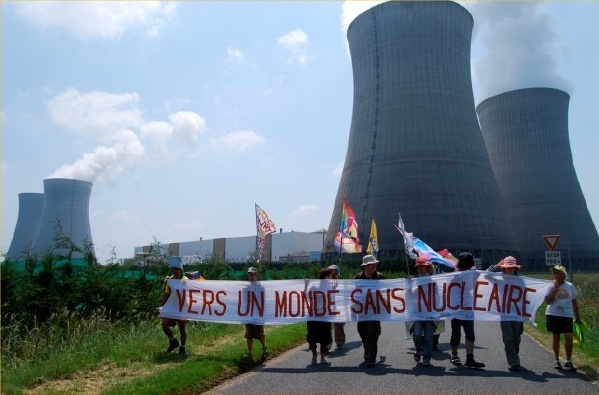 We walked from Candes to Chinon via the Chinon Nuclear Power Plant. The power plant operators 4 reactors, and 3 reactors are closed that were built during the 1960’s. 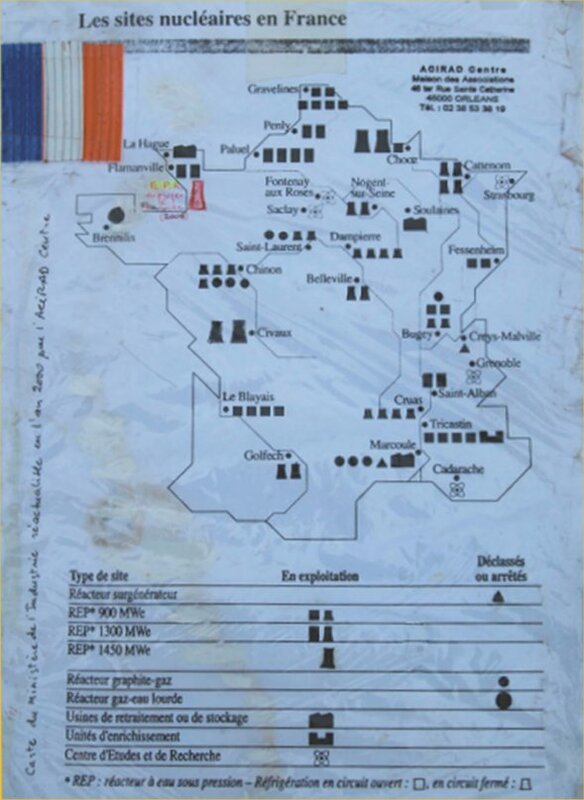 These were the very first reactors for France and the nuclear material from here was used for the first French nuclear tests in Algeria in the desert. 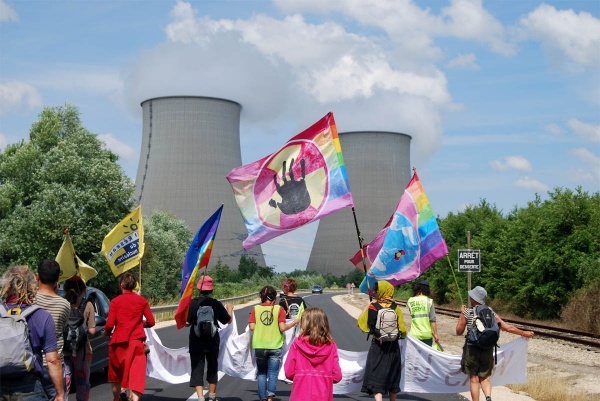 We learnt from local people that Chinon has many problems with the cooling towers due to the laws of the UNESCO National Park not allowing for the towers to be over a certain height. This has caused an outbreak of Legionnaire Disease as the cooling towers are not tall enough to allow for ventilation. This Power Plant is also situated on a fault line and the last earthquake measuring 4.3 was denied by EdF that they felt any movement. 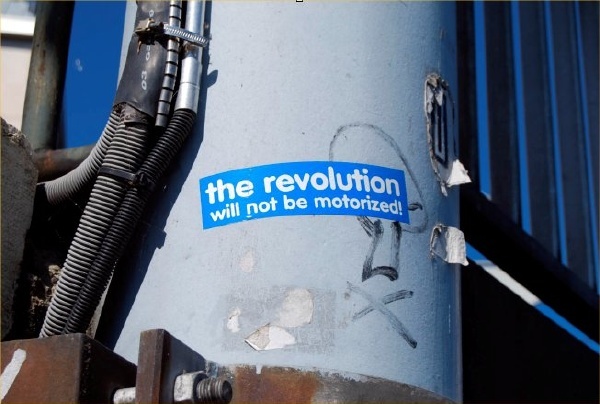 Many local people are concerned that one day there will be a major movement and this will impact on the power plant. They feel constantly at risk. EdF are trying to cut costs by reducing the number of employees and this is putting huge stress on workers already working long hours. They are also employing low skilled and low pay workers on this site. This has resulted in many suicides of workers at Chinon – 5 in 2 years. 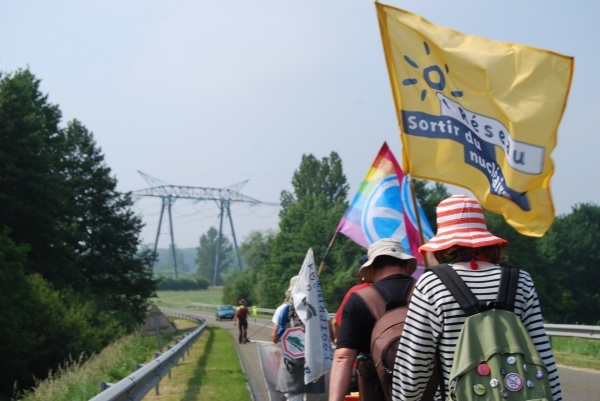 We walked to Dampierre Nuclear Power Plant on the 9th June. 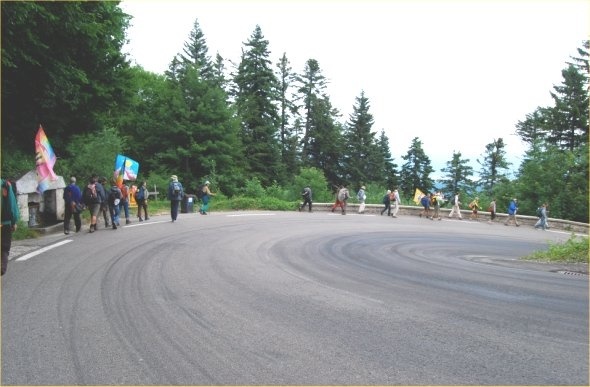 It was a really heavy day as we walked 15 kilometers to the power plant and then after our 2 hour action we continued another further 12 kilometers to reach our stay place for the evening. 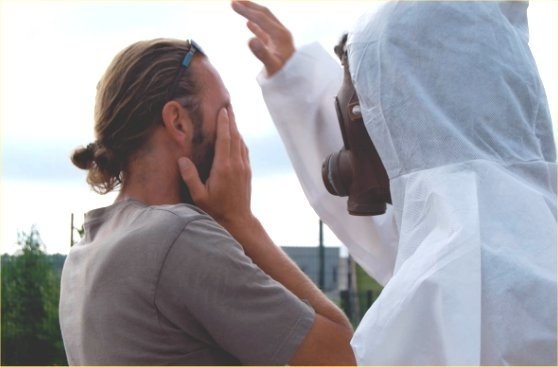 Many walkers felt the strain after the hot sun mixed with the nuclear site and long kilometres, and all took to their beds early this evening. 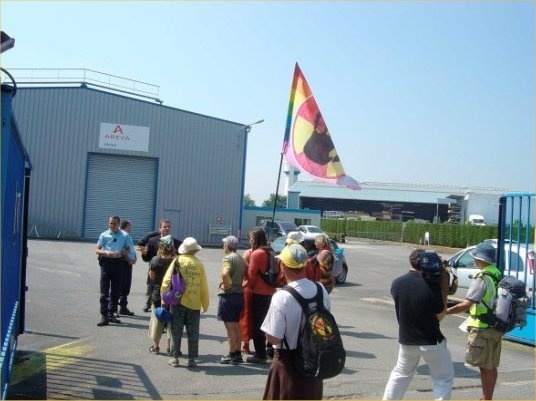 Dampierre with its 4 looming pressurized water reactors gave an eery presence as we stood at the main gate blocked by the heavy police presence. We were so close to the reactors we could not only see & hear the water blowing out the bottom but could feel the drops of water on our skin. 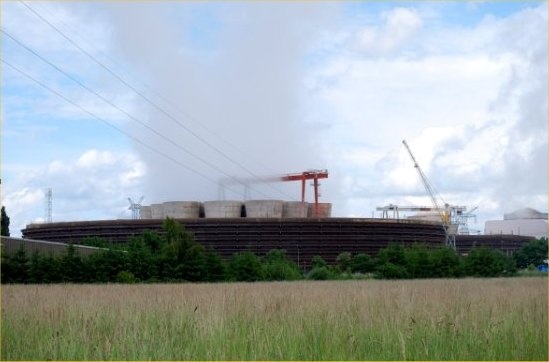 Dampierre power plant has had many leaks and accidents, the last one was only in May this year. What was really interesting on this day, was that a worker from the power plant came and joined us to share his story about how the privatisation of the power plant has resulted in the neglect of safety procedures due to the cutting of costs for more profit. A welcome by the Greens Party and Mayor was a great surprise to the walk as we entered Sens. A day before we heard news of a nuclear research centre will open in Sens, and this was a great opportunity for the walk to speak with the Mayor to oppose this centre. Again we are met with the same response “it will create jobs in the area”. 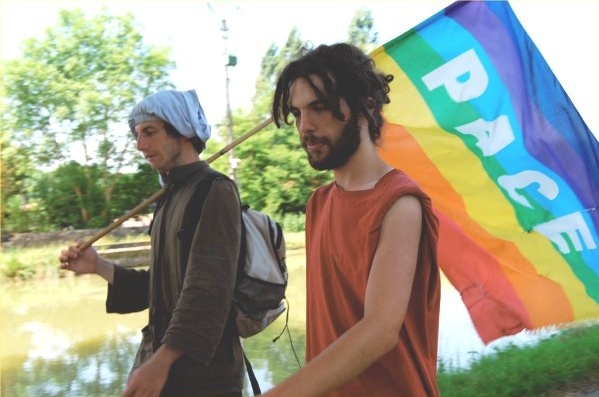 “In name of the Green Party of Yonne, I’m happy to welcome you in Sens. 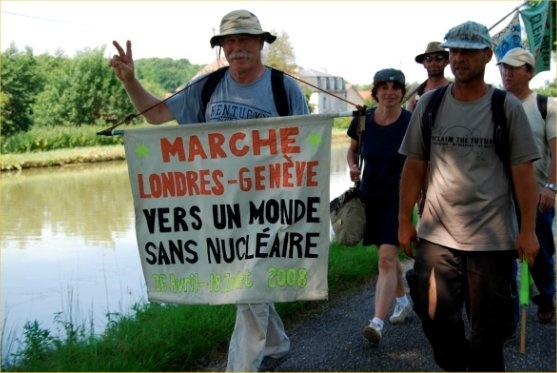 I salute your commitment in that anti-nuclear walk which leads you from London to Geneva through France. 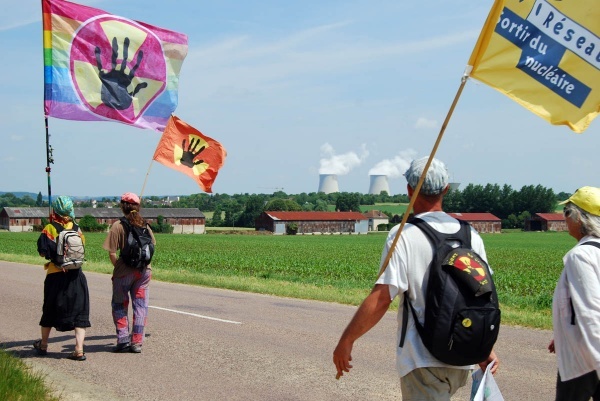 The way you chose, walking alongside many nuclear stations must denounce their huge number in our country, them most nuclearized in the world. 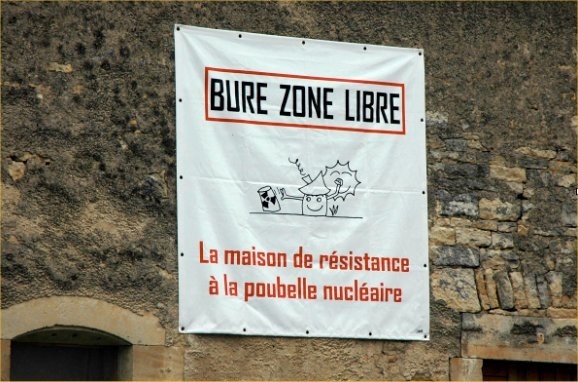 There is no nuclear station in Yonne, but we are surrounded by three stations: Dampierre, Belleville and Nogent sur Seine. Any incident in one of these stations could be very dangerous for us. And soothing speeches would not be able to reassure us. 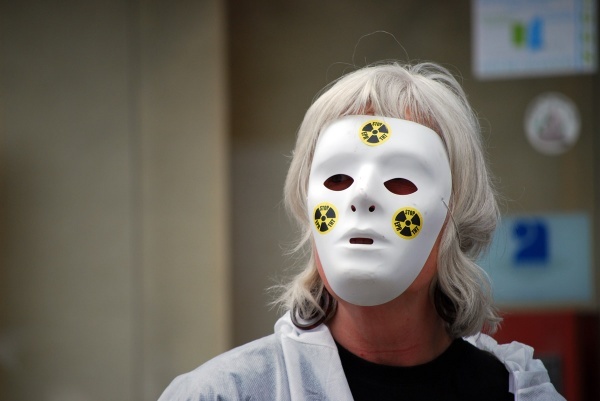 Since Chernobyl, we know they are lies, and they have just been told, very recently about a Japanese nuclear station. 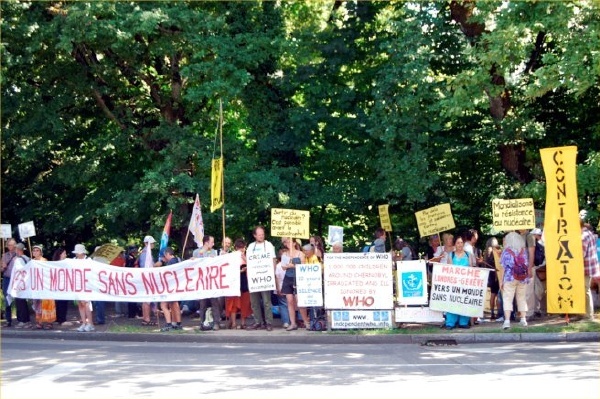 At the very moment when the town of Sens considers creating research departments in the nuclear industry, instead of entering in renewable energies, we thank you for your presence. 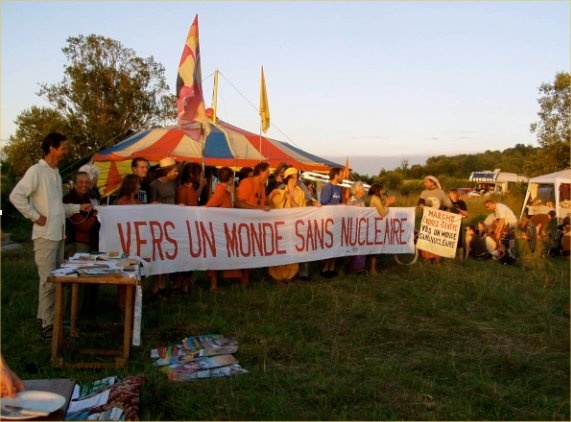 It shows that, in spite of disinformation and lobbies power, many voices go on informing about nuclear danger, and claiming a gradual disengagement towards a reasonable consumption of electricity and development or renewable energies. The sun was hot as we walked today. Most of us were in T-shirts in the early morning happily eating our breakfast under the bright blue sky and warm sun. 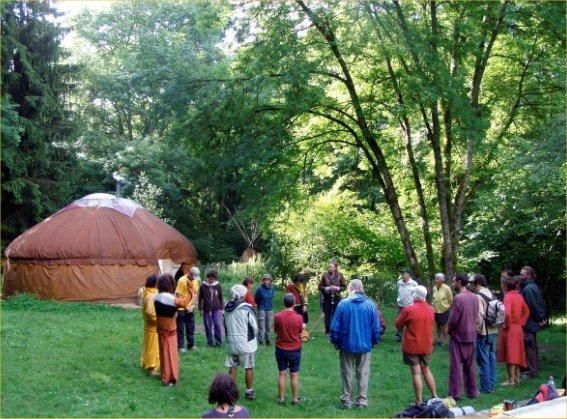 In tradition we begin each morning with a morning circle to greet each other and share information that maybe useful for the day. 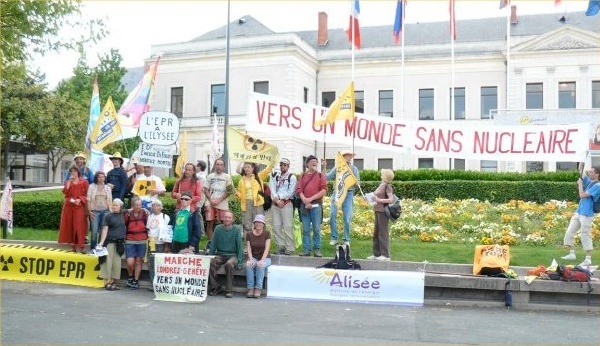 Today we talked about the action we were planning for the power plant as well as in the town of Nogent in front of the Mayors office. 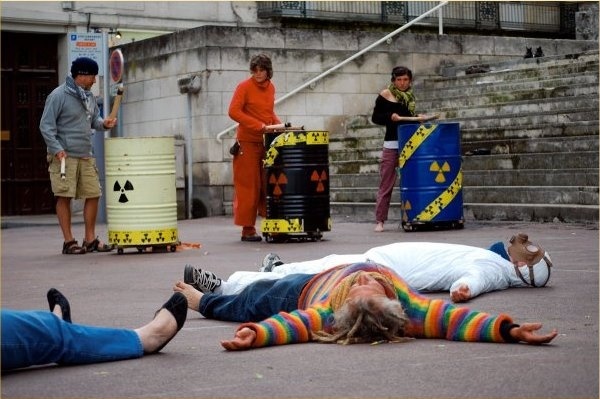 We had decided as a collective to do a ‘die in’ at both places, and with the music from Marion on accordion and Marcus on didgeridoo we choreographed a great performance of happy music with all of us playing and dancing and then gradually dying off as radiation begins to effect us. Dan in the radiation suit came and affected us as we each fell to the ground to the heavy sound of the drum. It was effective & powerful performance by all. The two reactors of the building of Nogent Nuclear Power Plant were intimidating, but not as intimidating as the thought of what was swirling around the giant pipes. 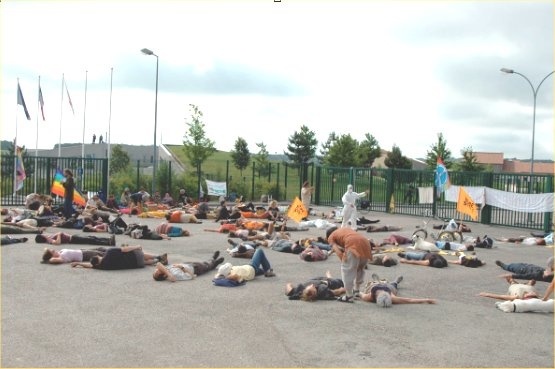 For me, the die-in is a time to reflect on the reality of the dangers of this industry across the world for all parts of the chain. I sat on the road after the die in to think about the uranium mining and the poison that is being spread all around the world. From Australia, I feel sad that we are digging this up and not only destroying the sacred land of Aboriginal people but how this poison is spreading through-out the world affecting people and the land. 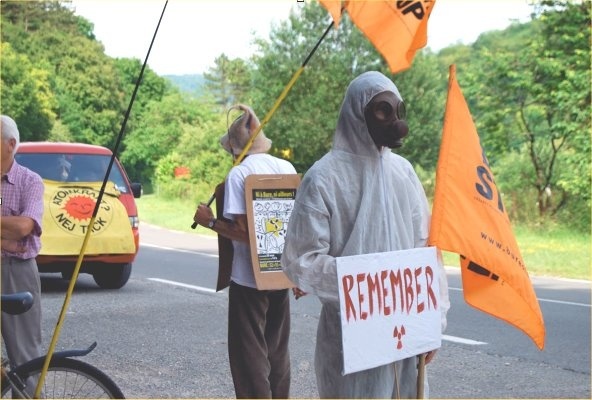 Many people here in France tell us how afraid they are living so close to the power plant and that its sight is a constant reminder of Chernobyl. 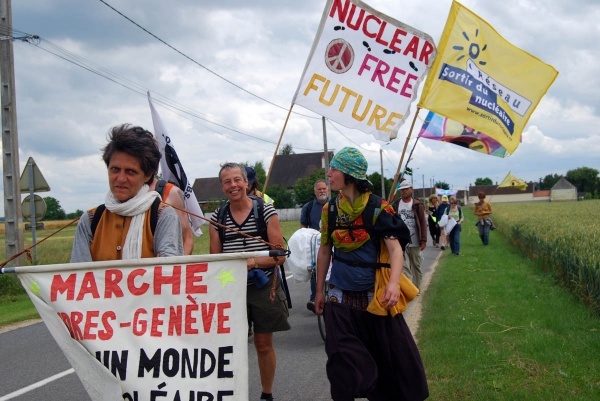 Our gift to these people is to continue to walk towards a nuclear free future – it can only be our biggest gift in appreciation of all that we have been given on this walk!! 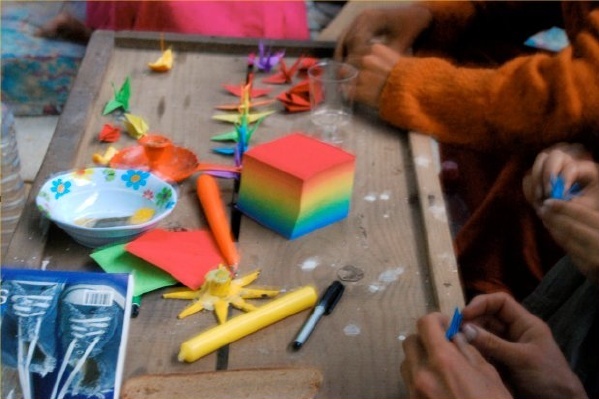 How many peace cranes do we have? 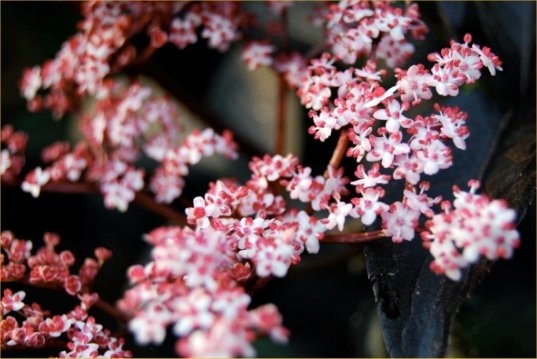 Don't be fooled by some of Mother Earth's beauty. 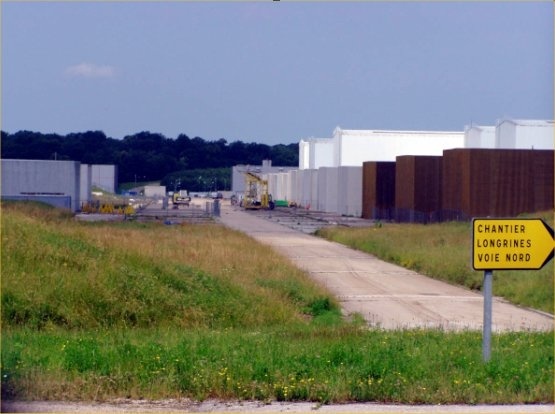 This area is known as waste dump alley as there are two nuclear waste dumps – low & intermediate level in operation, and a third one currently being proposed for the same area and further down the road is Bure – the underground high level waste storage centre. All owned by the French company ANDRA. Just around the corner, in Soulaines is another waste dump. This is for intermediate nuclear waste, and is the largest in the world. You can tell immediately that there is higher levels of waste at this site because of the level of security. 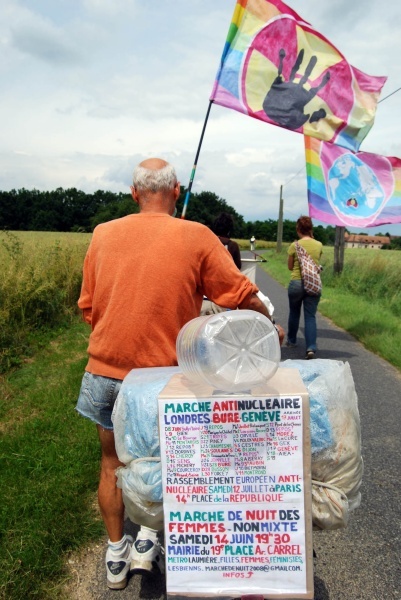 Michel Gueritte our local host for this area and a long time activist against the waste dumps told us that they have had the waste dumps since 1992 after much local protests. 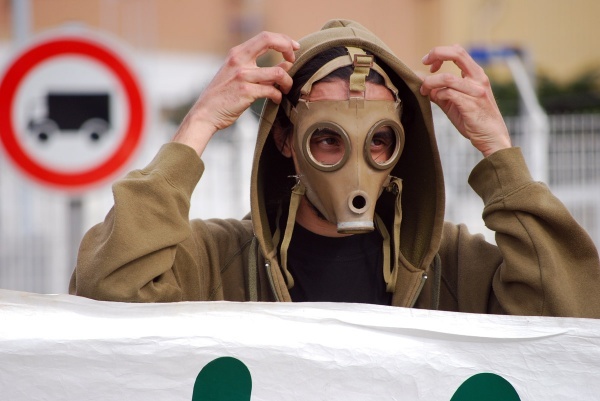 Now there are many health problems due to tritium & radioactive particles being released into the air and water. “20 people in 11 surrounding villages = 2,000 people have thyroid cancer”. There are also high levels of pancreas tumours. 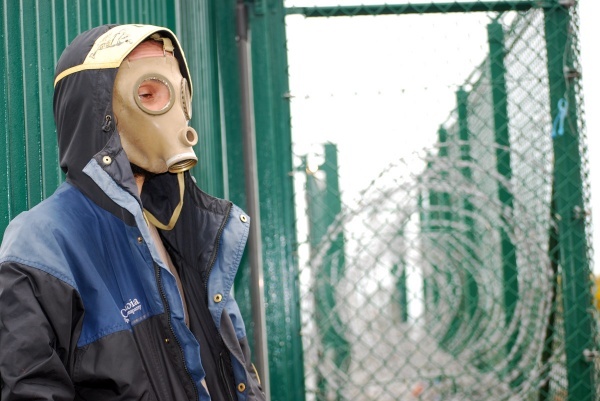 He said that this area “has been faced with the Chernobyl cloud, the irradiation of food and now the waste dumps that have all contributed to these high levels of cancers”. ANDRA told us that they are a transparent company so they allowed a few of us to take a ‘tour’ of their technology developments for nuclear waste storage. 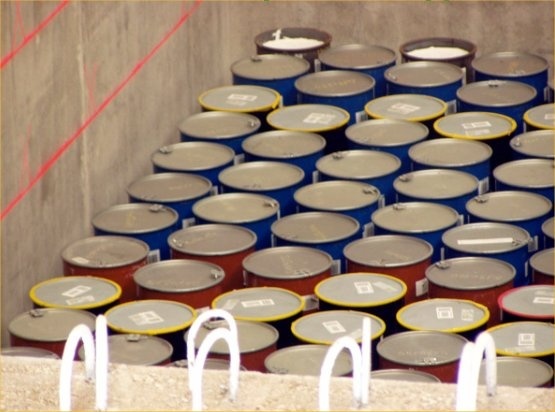 The future of waste ……… once these barrels ( below) fill these containers they will be covered in cement “to seal in” any radioactive particles and these containers will then be covered in clay and like the other waste dump – a radioactive mountain will be made for future generations to enjoy. A heavy day …. we were all in need of some positive news!! Near the waste dump was a statue that had been made on sacred ground in honour of the people who had resisted the waste dump in the area. 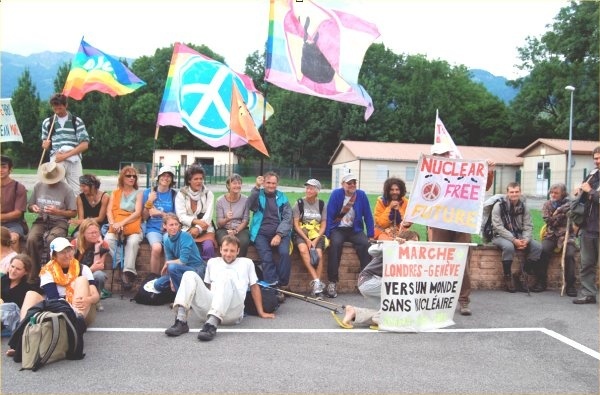 Michel had covered the statue and when we arrived he unveiled that he had made a plaque that honoured the walkers from London to Geneva toward one world without nuclear . Thanks heaps to Michel for all his wonderful support. Local people meeting us along the way with music. 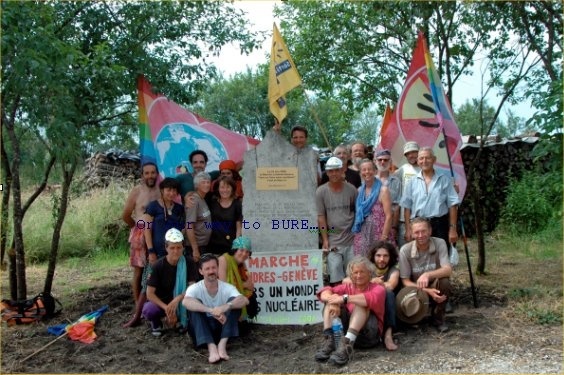 In response to the underground high level nuclear waste dump in Bure each year activist from around France and Europe come together and hold a 2 day festival to raise awareness and share new skills to resist the waste dump. 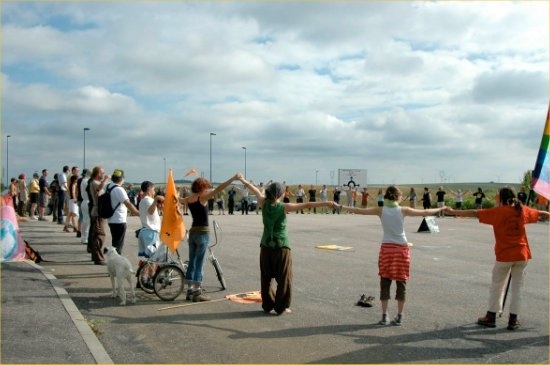 Following day we did an action in front of the gates of the waste dump….. 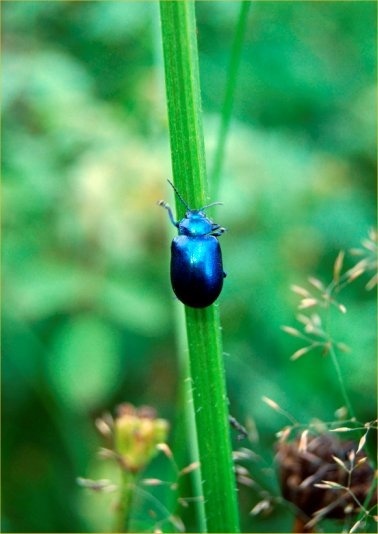 If I don’t see everything will be all right ……..
until the radiation poisons all life……. 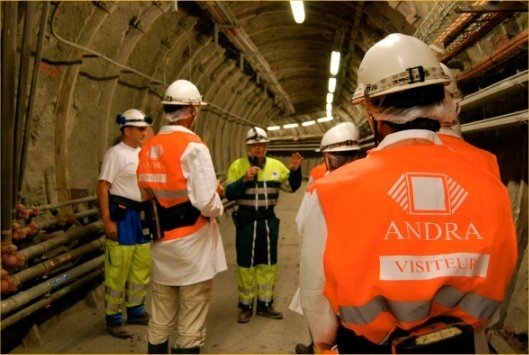 Plummeting 500 meters under the ground to take a look at ANDRA’s solution to the high level radioactive waste gave me an overwhelming sick feeling. Breathe deep. Breathe deep. This is one of my most deepest feelings of such destruction. A feeling of complete heaviness. Look around at this technology. 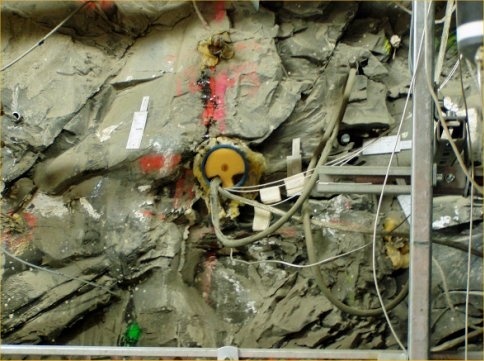 Look at this Earth - dug into, hooked up to tubes, probed and prodded. Plundered. Technological ways and methods. Science and engineering..
All around me while I was deep in the ground all I could see was violence, destruction and force. This is sacred Earth abused. And I felt that this is what the industry is about -. not feeling! Removing the sacredness from Earth so that we can destroy, because if you felt a deep connection to the Earth you would not destroy it like this. ANDRA justify this. The Governments justify this. Many people accept this without knowing the damaging truths and consequences. 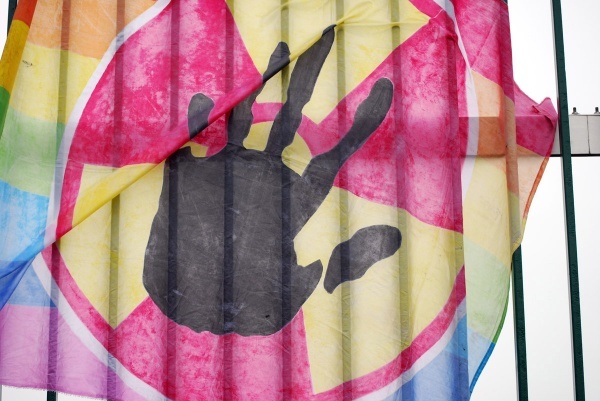 There is big dominance & money in finding a solution to the nuclear waste problem. We have to do something with the already waste. But why do we keep mining the uranium? 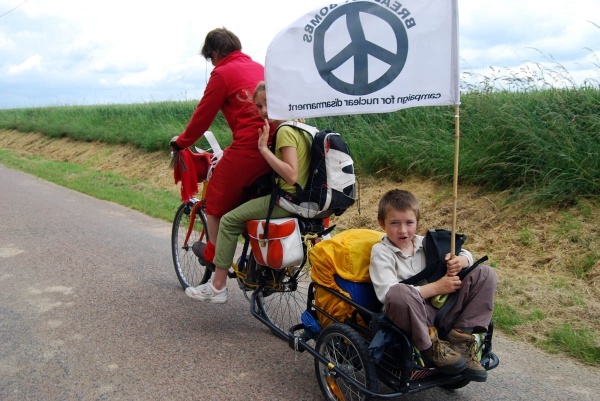 Thank you ANDRA for cofirming with me the belief that we must work towards a nuclear free future. I remember the words of John Trudell “while you seek your technological advances, flowers are dying”. 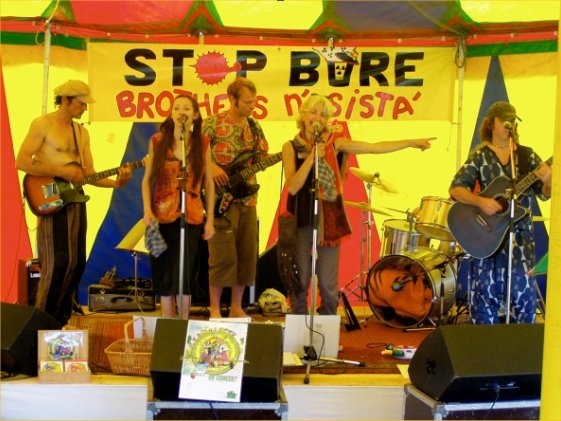 To the activist in Bure - good bye….stay strong and know we are with you in solidarity around the world to STOP BURE!! 29th June Reynel - Mayor’s House. 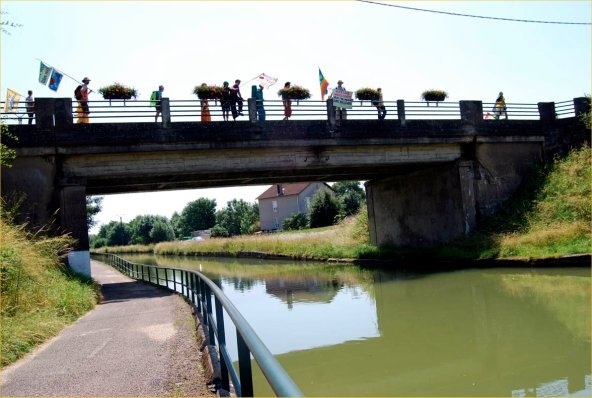 2nd July – walking into Langres for lunch. 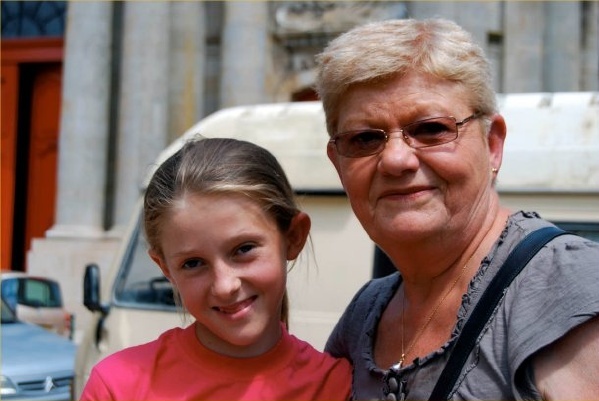 A young women spends time with her foster mum to take relief in France from the effects of Chernobyl. 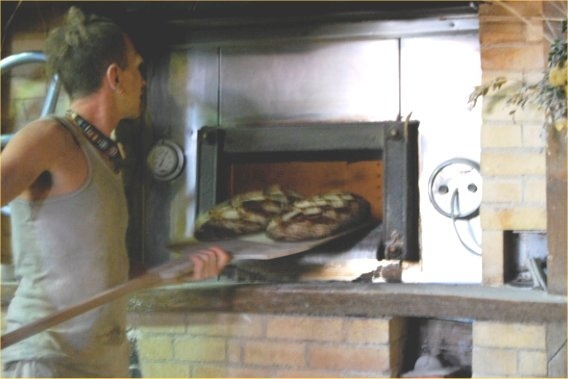 Wood Fire Oven Bakery, Sacquenay - mmmm...um!! 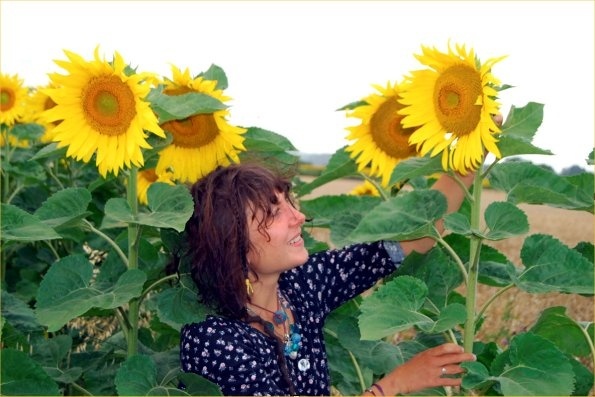 Dan takes a well-deserved rest while Lena shines with the sunflowers. 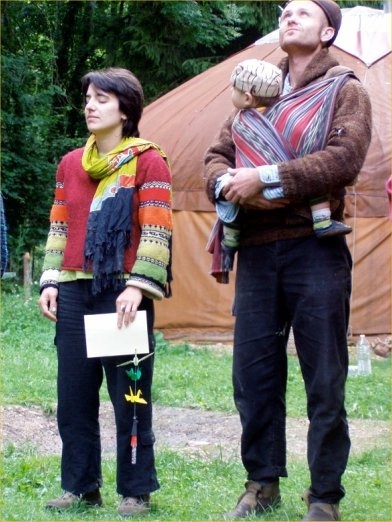 Ivan, Sarah and their children. 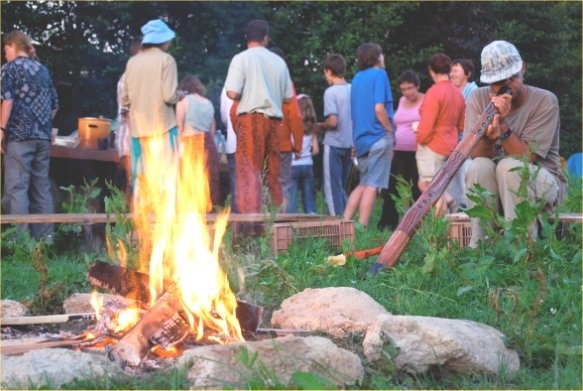 Thanks to the great spirit who moved us to connect with these inspiring people on this beautiful land. Thank you for the opportunity to join them, and to walk. 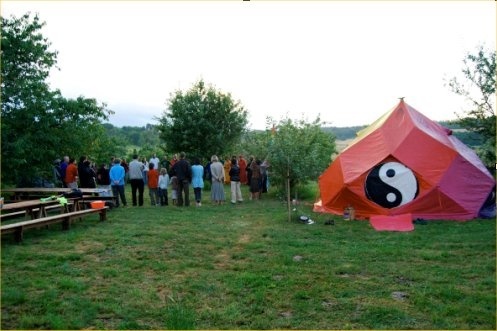 I give thanks for each person gathered here, for all the people this walk has touched, all whose stories are now intertwined, connected, charged. I give thanks for all whose voices have been brought so far in Love and Fearlessness. I give thanks that the people let this love and truth change them as it should. Turn us from fear and violence, toward sanity, compassion, peace. Have mercy on us, a broken people. Let all these words, sweat and steps taken. Be a force for peace in our own hearts and minds, and in the world. 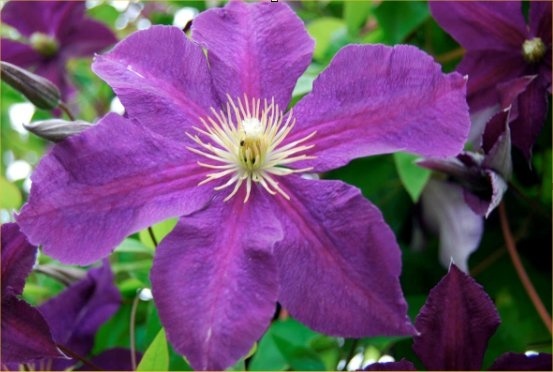 I believe in the transformation, I believe in the power of awareness. I believe another world is possible, is here. 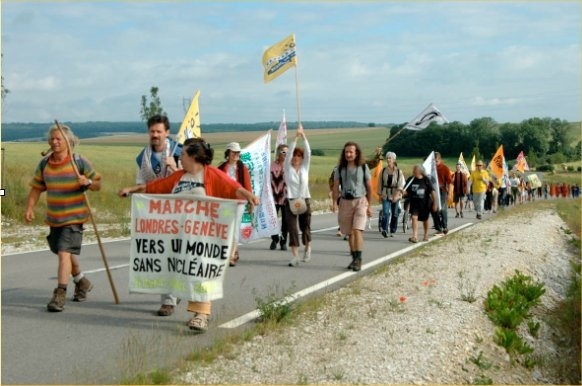 The final part of the long walk was filled with many mixed emotions, new people joining, rain and the end of our visits to the nuclear sites in France. 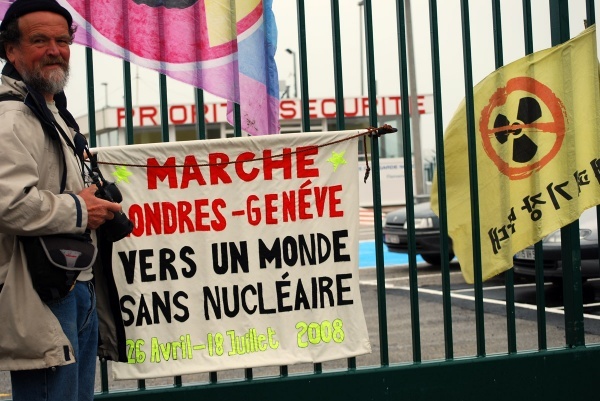 Valduc was the last site we visited – the facility where French nuclear weapons are made. 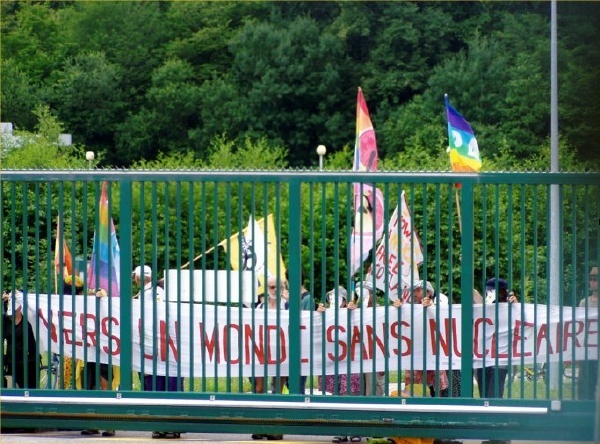 We were joined by activists from Dijon and held a silent vigil for an hour while young people tied colourful peace cranes to the fence. We turned the grey gates into a beautiful sight of flying cranes of hope. 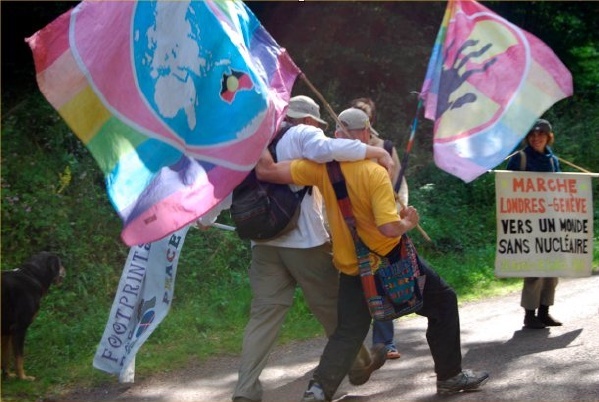 Larry and Jon dance the day away…..
6kms before our stay place the walkers where picked up by horse and cart …..much to the relief of weary walkers!! The walk participated in 2 day simple living festival. 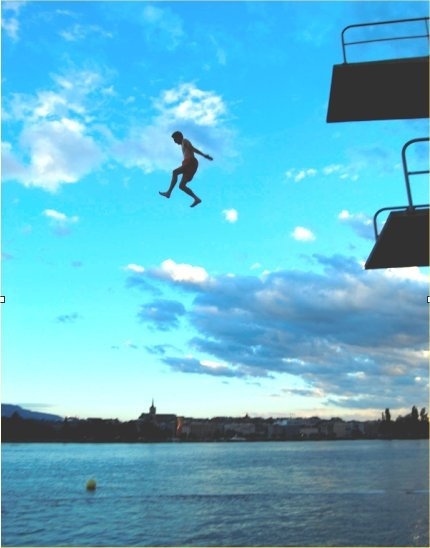 The day before we arrive in Geneva. One more time to unload the van – Lena?? 18th July our last day into GENEVA. Down we go into Geneva!! 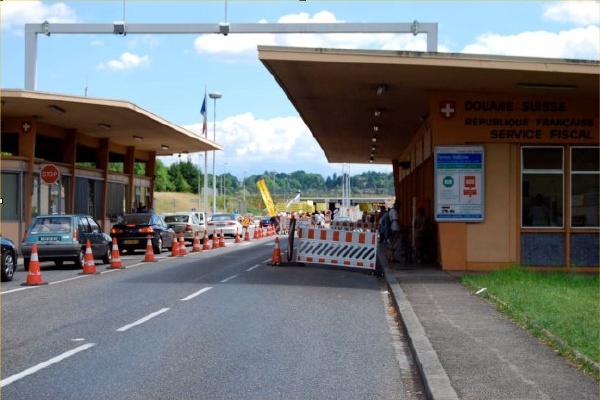 Finally we make it to the border….. In front of the United Nations refreshed!! Or a shower for some!! 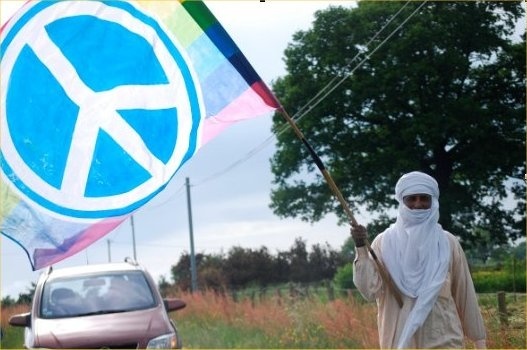 Little more than a week to go, before I am off to London to join this year's International Peace Walk. 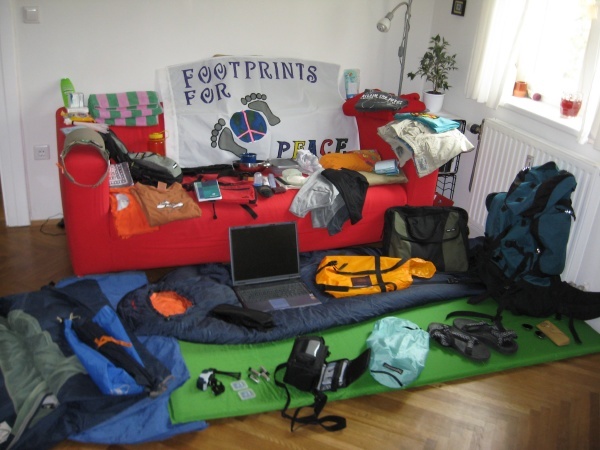 We start walking April 26th and end July 19th in Geneva. The picture on the left is everything laid out before packing. 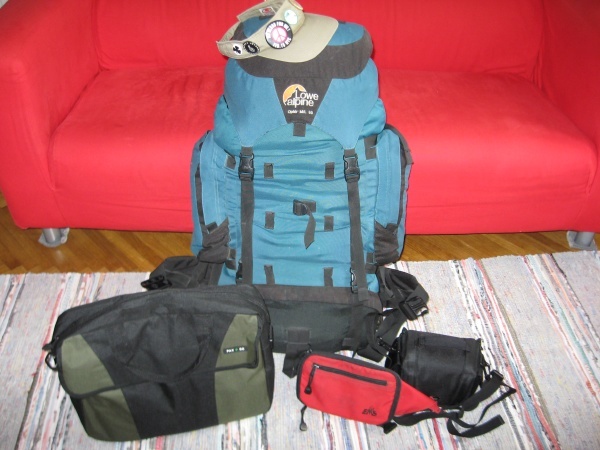 Pucture on the right is my big backpack loaded (the tent, sleeping bag and sleeping pad are inside the pack), my travel wallet, along with the laptop and camera cases. Seen below is my walk checklist. Gerti will be joining the walk the end of June. 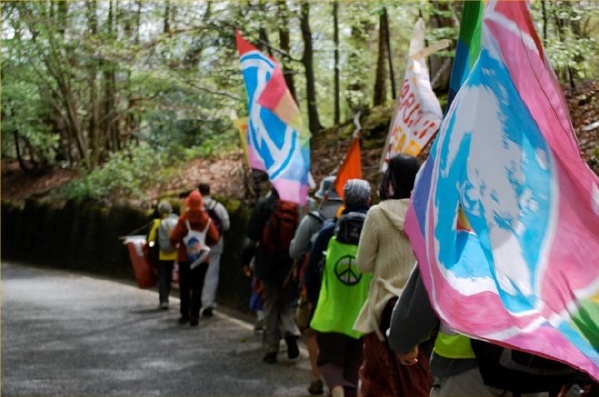 Three Weeks of the Walk for a Nuclear Free Future. 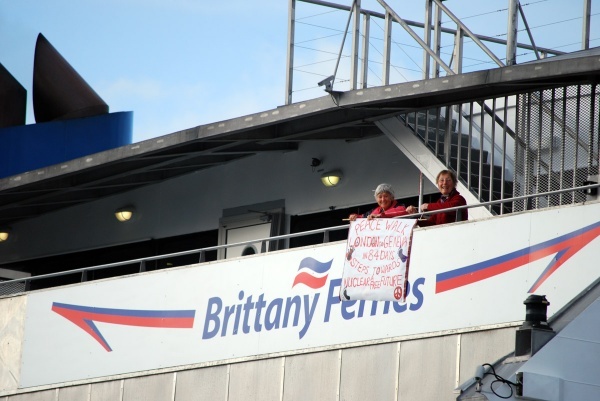 Five days of walking in England led us to the crossing of the English Channel by Ferry and landing in Cherbourg, France. Our core group consisted of representatives from 8 countries. 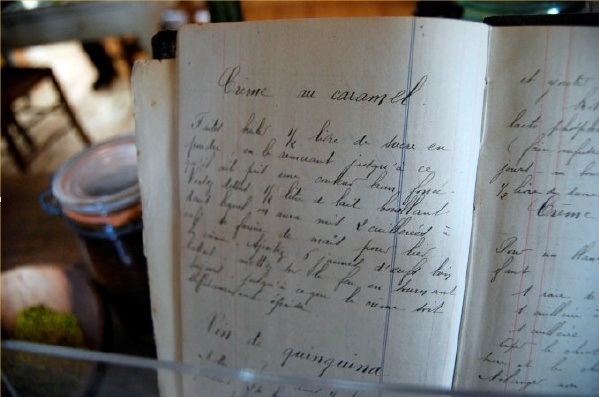 Our meetings had to be conducted in the two major languages of French and English. 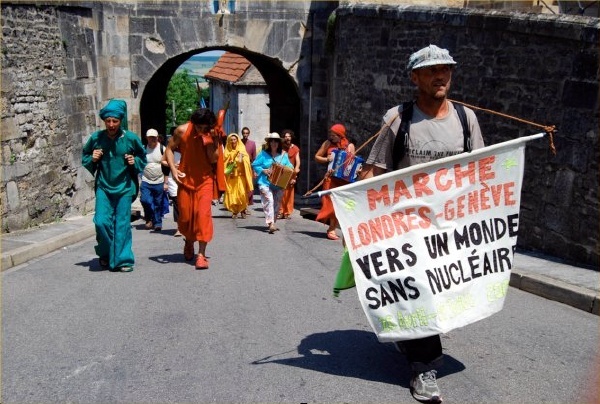 The major part of the walk was held in France and organized by the French Non-Governmental Organization, NGO, Sortir due Nucleaire. The following two weeks that I was on the walk followed the Normandy coastline, which is remarkably beautiful. We visited La Hague and the Cogema nuclear fuel reprocessing plant. Thisfacility discharges large volumes of radioactive liquid wastes into the English Channel. This has contaminated the beautiful water and beaches as far as the Arctic Circle. Although there are elevated rates of leukemia among young people close to the site, people I spoke to seemed unaware of the danger posed by these releases and freely swam with their young children in surrounding beaches. We also visited the Flamanville site of two nuclear power reactors where they are building a new reactor. 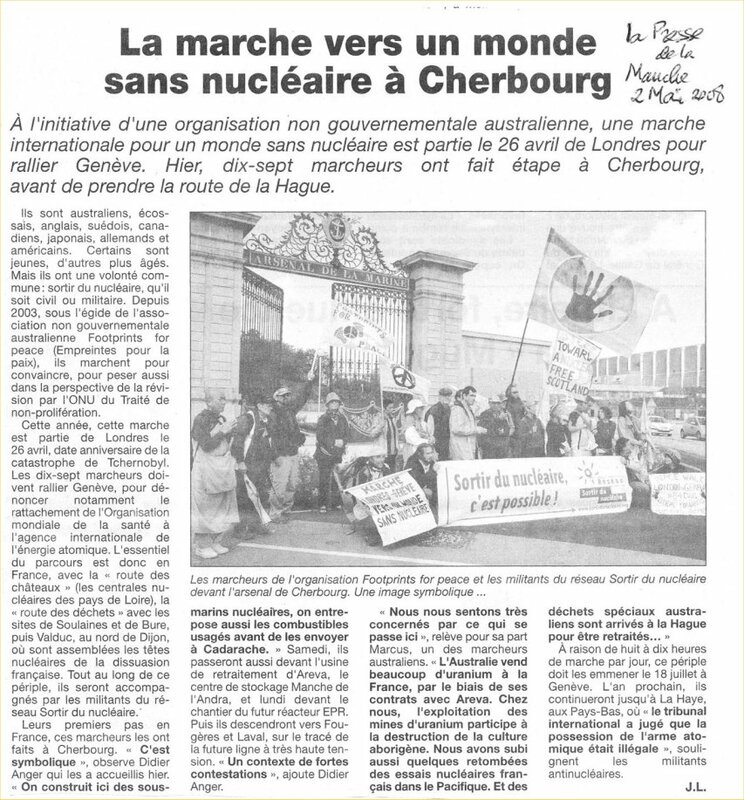 Although 25,000 people demonstrated in Cherbourg on the 20th anniversary of Chernobyl, the building of new nukes is supported by the French President. 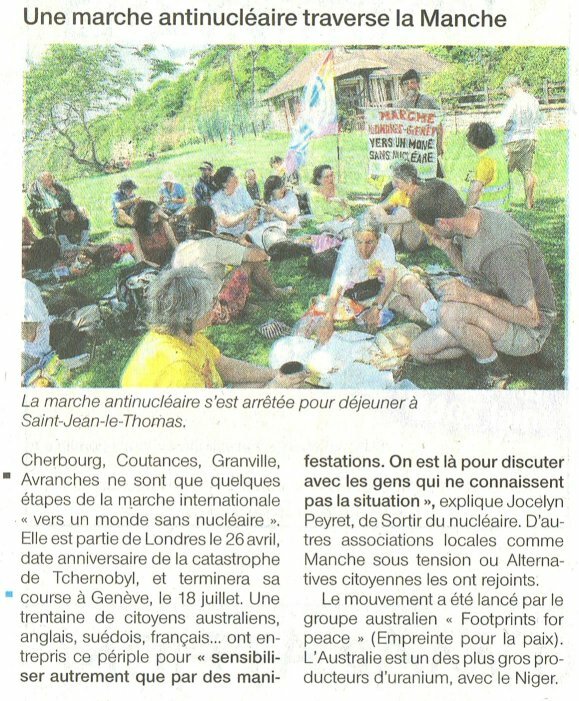 We were given in-depth talks by representatives of Sortir du Nucleaire.The transmission lines from the new plant at Flamanville are strongly opposed by the farmers association that hosted our two weeks in Normandy. 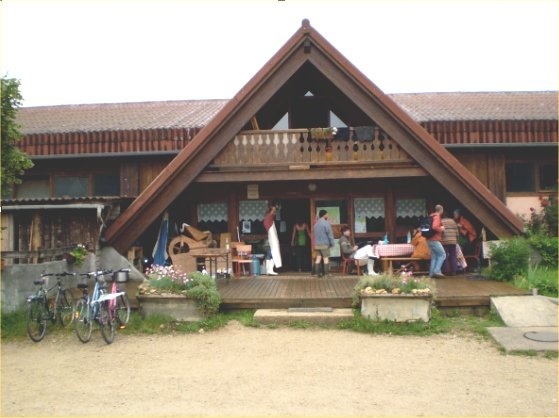 Their generous hospitality gave our group many beautiful hay barns and fields to sleep in. Nightly food donations of fresh produce was bountiful and nutritious. One family whose farmyard we slept in had built us an outdoor sink, shower, with super hot water and a composting toilet. As it was our rest day, the hostess even did ALL our laundry for us. We had lots of fun with them and as we left, they ran ahead of us and serenaded us with a saxophone playing Amazing Grace! 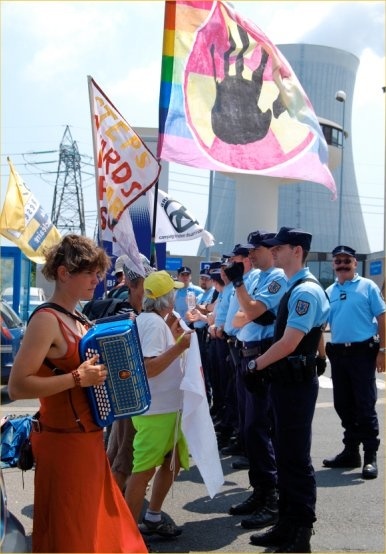 Another delightful dimension was added when people joined us with accordions. 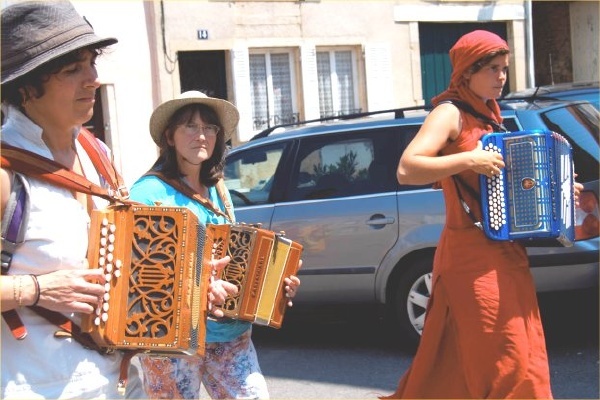 We found ourselves dancing in the village squares accompanied by many smiling men and women with accordions. One woman actually walked all day with us carrying her accordion. Up and down steep terrains as well as on the beaches, she accompanied our walk. When I left on our second rest day in Avranchez, I felt I had participated in a VERY important and worthwhile experience. 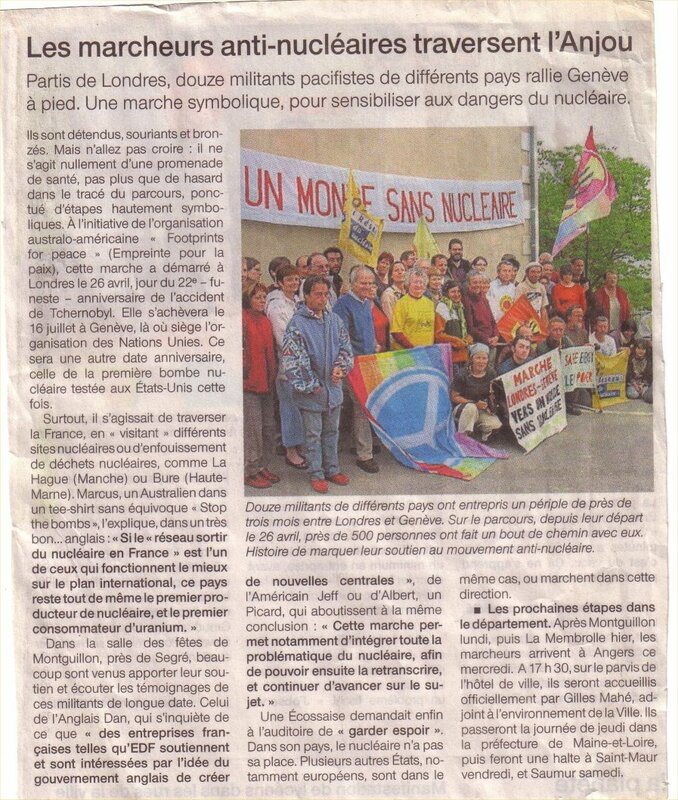 I learned quite a lot about the strength and determination the French have in opposing their countries continued dependence on nuclear power.I fell that by sharing our collective resistance to nuclear power, it gave strength to each and every one of us.Special thanks go to the huge efforts of Footprints for Peace and Sortir du Nucleaire for organizing this extremely timely and important event and to all who hosted us every day and night of this remarkable journey. 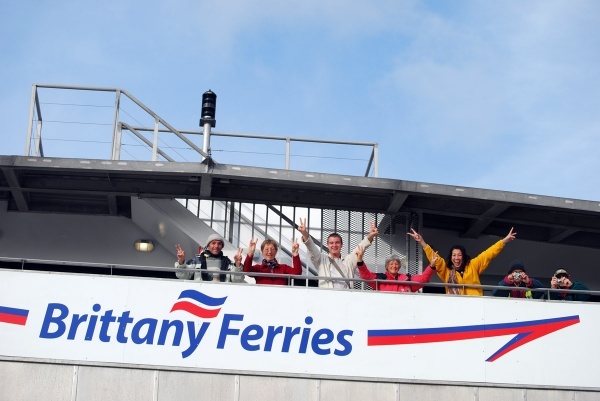 Channel by Ferry and landing in Cherbourg, France. Our core group consisted of representatives from 8 countries. 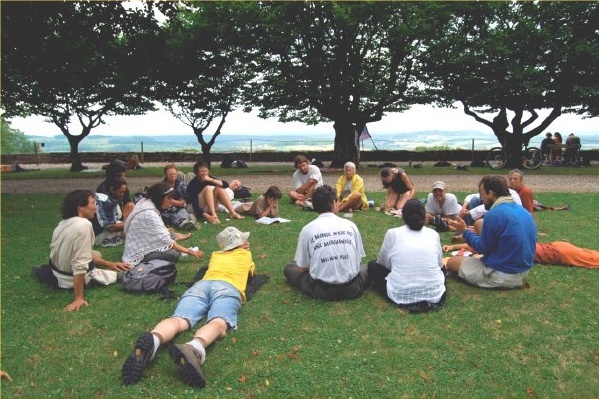 Our meetings had to be conducted in the two major languages of French and English. English Channel. This has contaminated the beautiful water and beaches as far as the Arctic Circle. Although there are elevated rates of leukemia among young people close to the site, people I spoke to seemed unaware of the danger posed by these releases and freely swam with their young children in surrounding beaches. We were given in-depth talks by representatives of Sortir d Nucleaire. 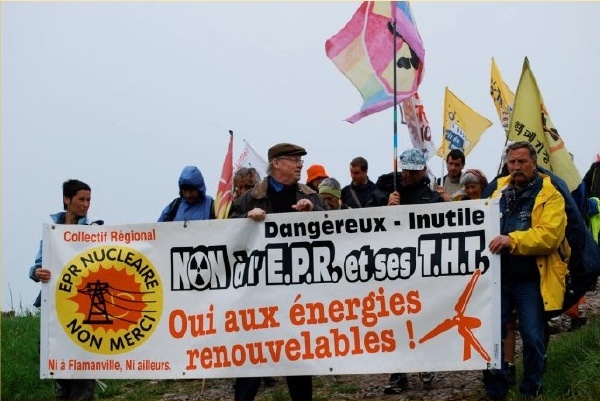 The transmission lines from the new plant at Flamanville are strongly opposed by the farmers association that hosted our two weeks in Normandy. 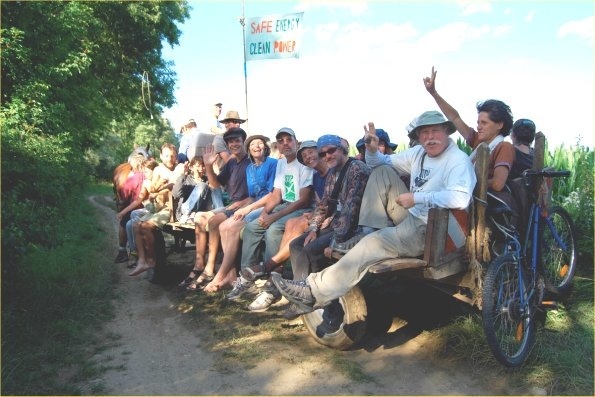 Their generous hospitality gave our group many beautiful hay barns and fields to sleep in. Nightly food donations of fresh produce was bountiful and nutritious. One family whose farmyard we slept in had built us an outdoor sink, shower with super hot water and a composting toilet. As it was our rest day, the hostess even did ALL our laundry for us. We had lots of fun with them and as we left, they ran ahead of us and serenaded us with a saxophone playing Amazing Grace! all who hosted us every day and night of this remarkable journey. 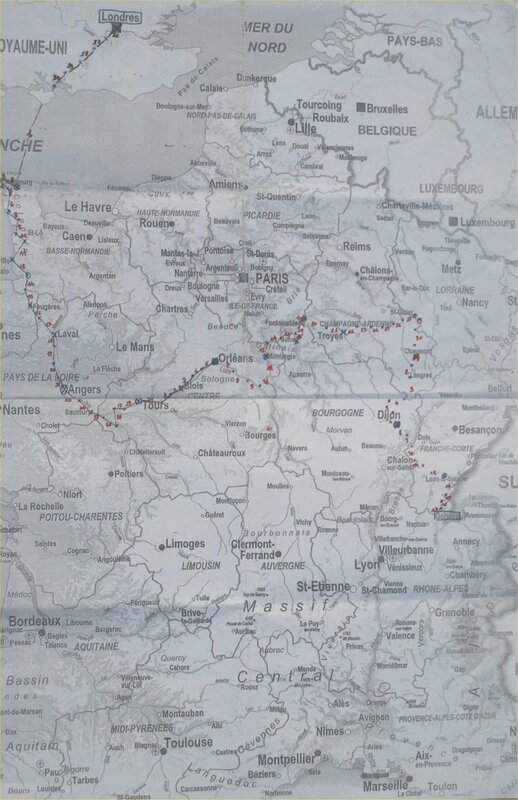 We have been in France for 28 days, and over a month since the walk began. 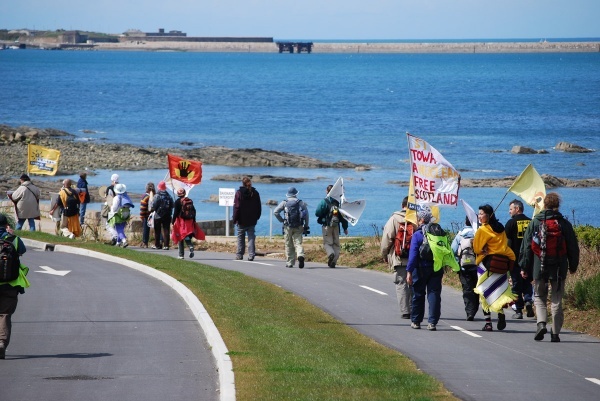 We have had huge support from not just local people but globally the walk has been joined by people from Japan, Canada, German, France, Italy, Australia, Sweden, Scotland, England, Niger & the United States of America. 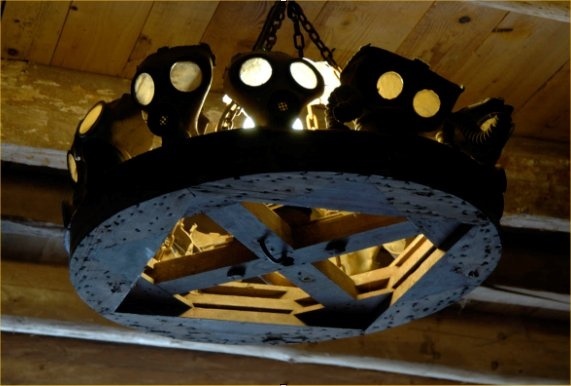 We have found out many interesting stories that make sense as to why there is a resurgence in nuclear power – money, greed and power of family affairs!! 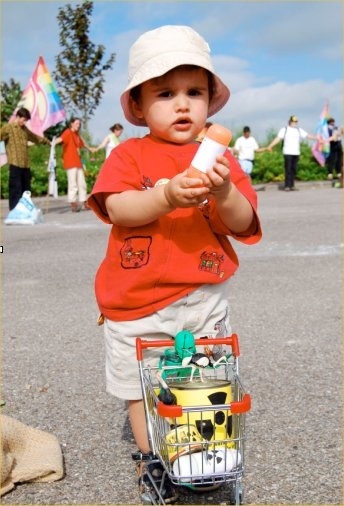 The head of AREVA is the god-father to the French President Nicolas Sarkozy’s, children. 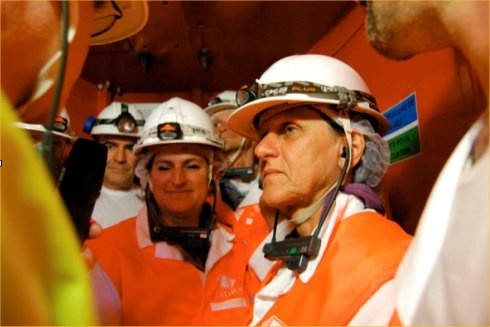 The British Prime Minister – Gordon Brown’s brother now works for Electricite de France (EdF). People are horrified to hear about the role Australia is playing in fuelling this industry through the mining of Uranium. 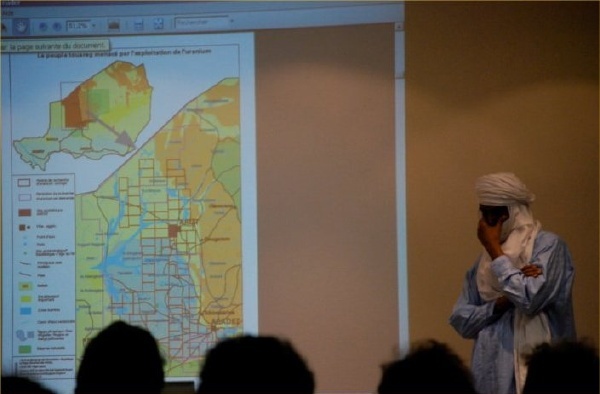 Some people are aware of Australian companies trying to gain access to uranium deposits in Niger while causing major problems for the Tuareg people. But many are unaware of the same exploitation happening in Australia, with uranium mining happening in World Heritage listed areas and the massive use of water happening in some of the driest regions of Country. 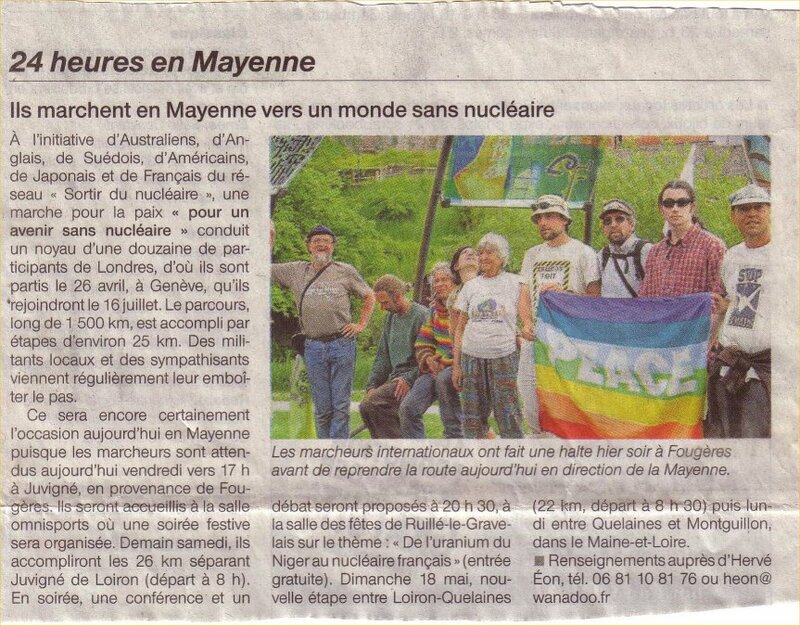 We are continually speaking with the media and people on the streets through our street flyers and in organised public meetings about the lack of respect towards Aboriginal Peoples and the environment through the uranium mining and the governments commitment in opening Australia up to an unprecedented uranium mining boom. 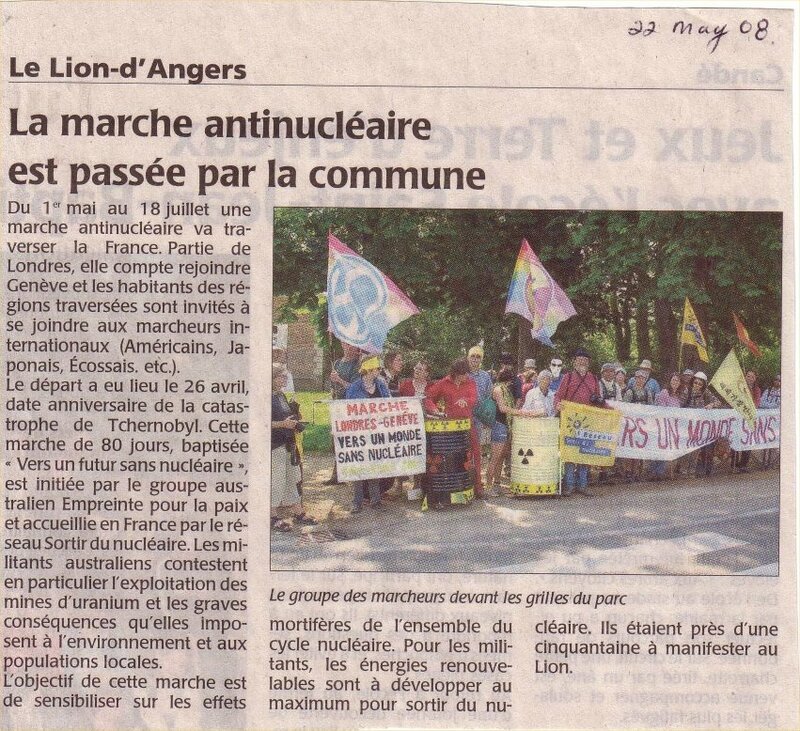 Linking the beginning of the nuclear chain with the campaigns here in France & globally has been a strong statement made by all walkers. 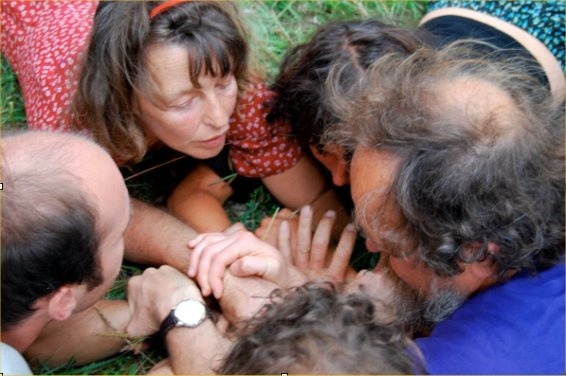 Recently we have received a copy of Scott Ludlam’s “Climate of Hope” that has been translated through sub-titles into French and will now be screening this at the local public meetings and distributing this DVD as much as we can. yeh yeh!! 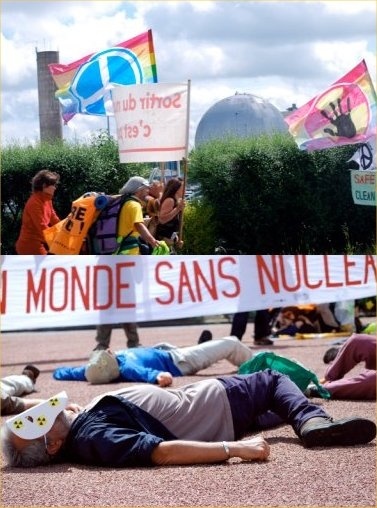 We have been invited by the group we are working with Sortir du Nucleaire to participate in a 2 day conference in Paris for representatives in surrounding countries to meet and discuss how to stop the massive resurgence in nuclear power here in Europe. 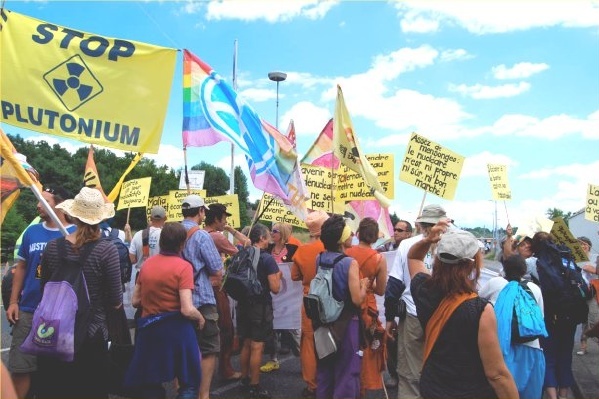 The organisers of this event would like to include in their campaign the connection with Niger and Australia through the uranium mining issue to create a global awareness of the devastation the whole nuclear chain creates and solidarity with the people who are affected by the mining. 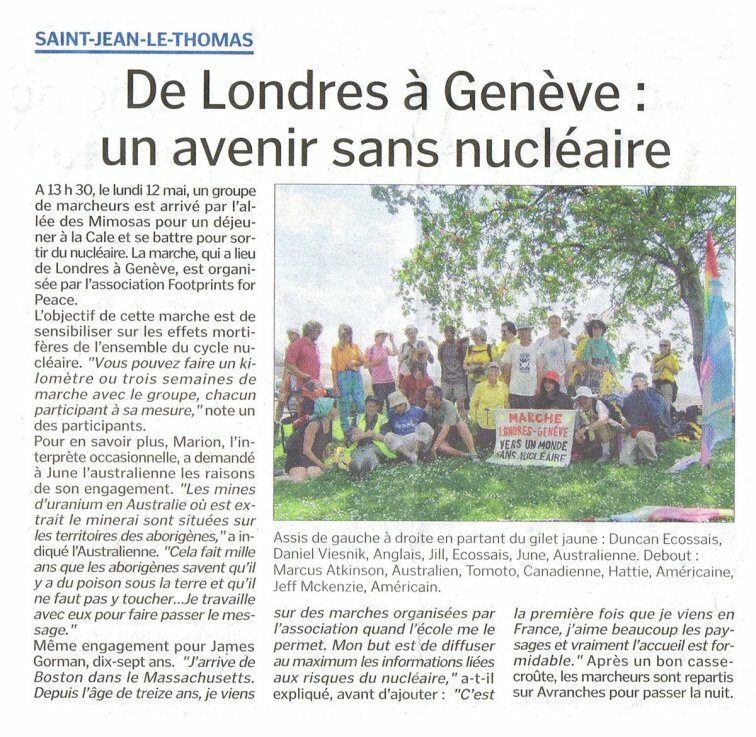 In Geneva the walk has been asked to meet the Secreteriat of the Conference on Disarmament to present them with a document to explain our global action on how the nuclear cycle contributes to weapons proliferation and the need to eliminate the nuclear industry as the main point to disarmament. 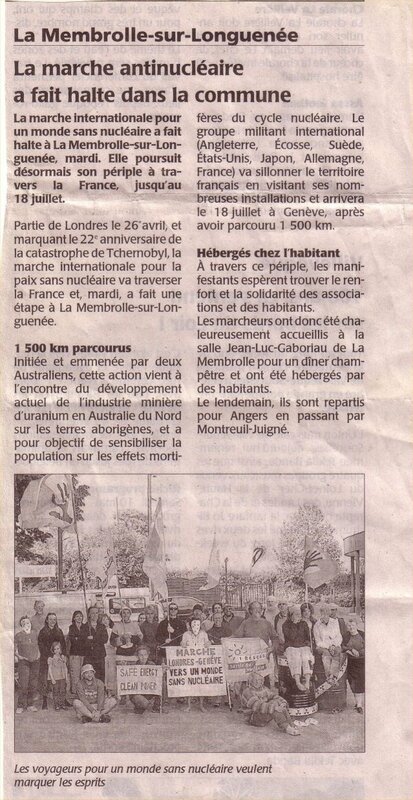 We have also been asked by Sortir du Nucleaire to attend their week long summer camp during August to host a workshop about the nuclear issues in Australia. This will be a great opportunity to re-visit and re-connect with the local people who have organised for us on this walk. 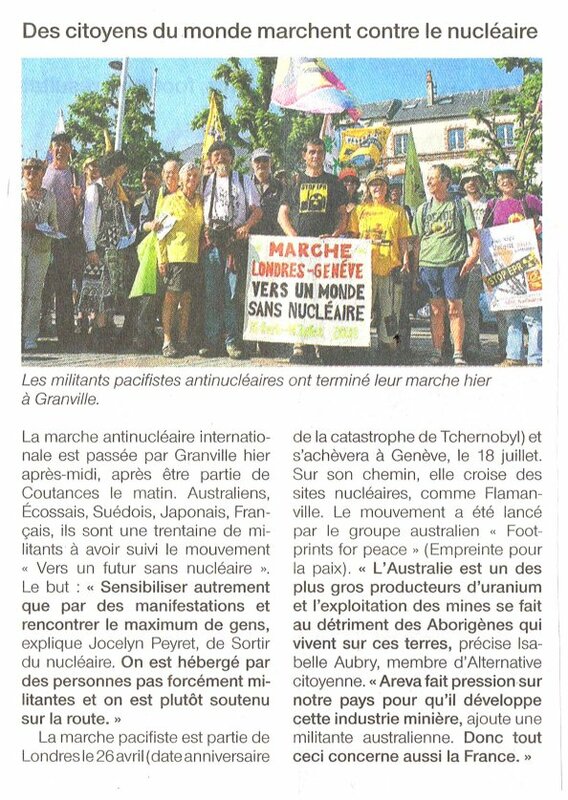 We feel that we are really building strong connections with the French anti-nuclear activists and are creating great awareness of about what is happening in Australia & globally with the local people. 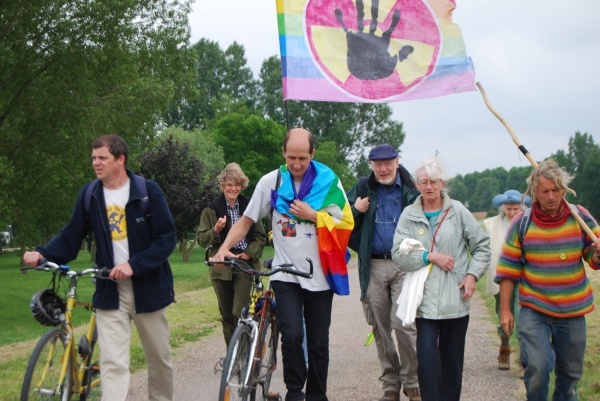 This event is the fourth in a series of great historical peace walks. 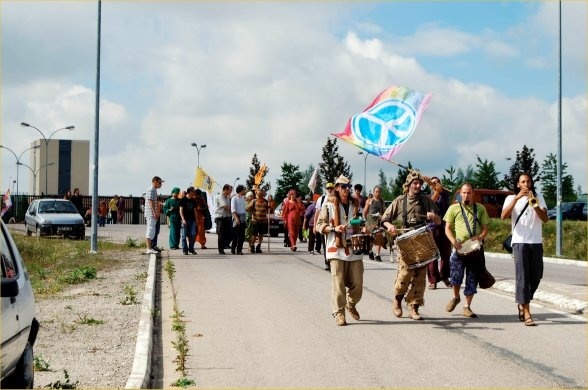 The first of these walks was known as The International Peace Pilgrimage Towards a Nuclear Free Future. It was carried out in 2003-2004. It began in Roxby Downs Australia and ended 9 months later in Hiroshima Japan. Imagine walking for 9 months through the desert heat and the winter snows! 9 MONTHS! What a feat! Talk about courage and determination! I wonder if anything like this has ever been done before. 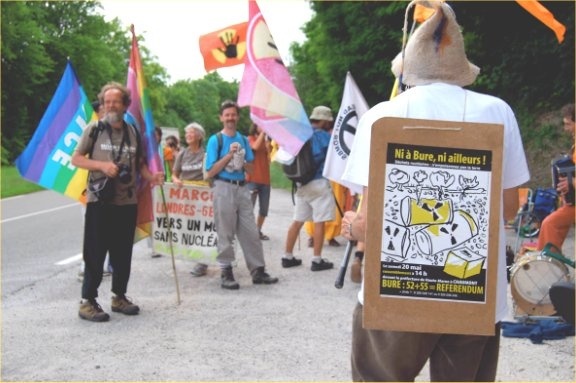 In 2005, the year that the NPT was reviewed at the United Nations, the group walked from The Y12 plant in Oak Ridge, TN to the United Nations in New York. The walk lasted about 3 months. 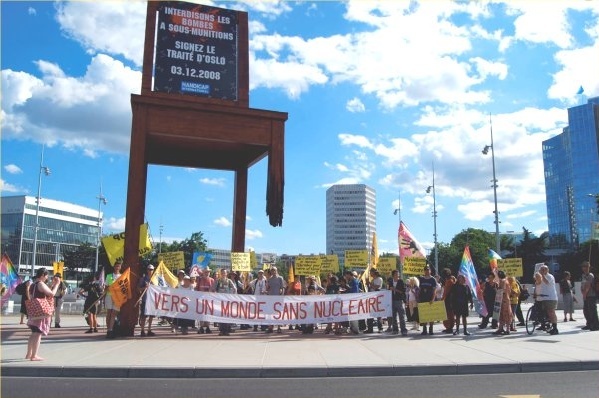 Members of the walking group addressed the United Nations and expressed their concerns about the expansion of the Nuclear threat and prayer vigils were held outside the United Nations in hope that they would listen and act upon these concerns. 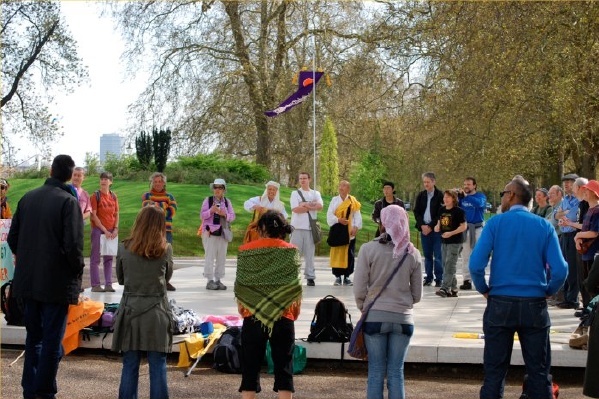 In 2007 a walk was conducted from Dublin Ireland to London England. 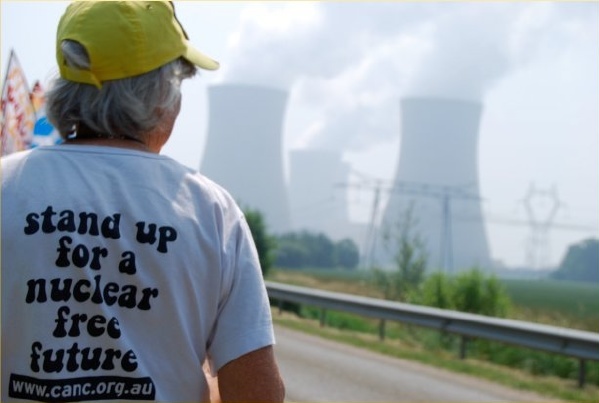 This walk lasted 3 months and was conducted through some of the most nuclear waste polluted areas on the planet. The response to this walk was amazing with many communities and thousands of local folks taking part! 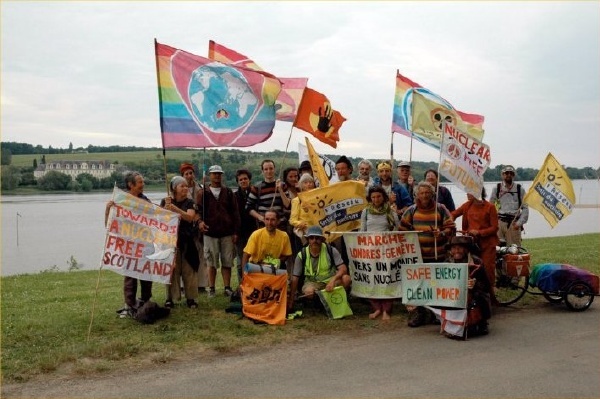 Hundreds of thousands of people all over the world took parts in these events and the much needed information about the evils of the nuclear industry was given out by the leaders and participants of these events. Those who took part and gave of themselves are the real heros of this world! 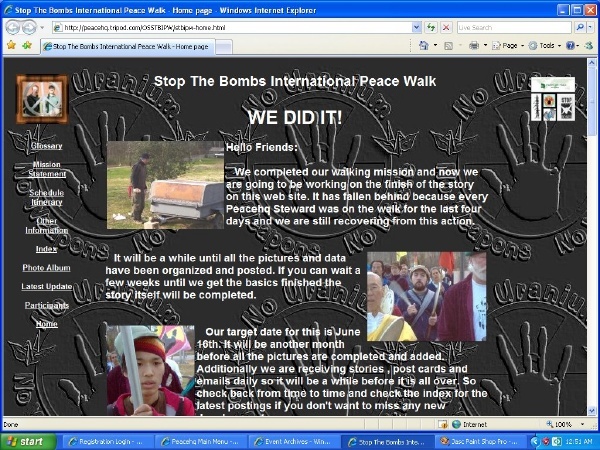 In 2010 a repeat of the Stop The Bombs walk will be made once again to the United Nations when the NPT is once again reviewed. 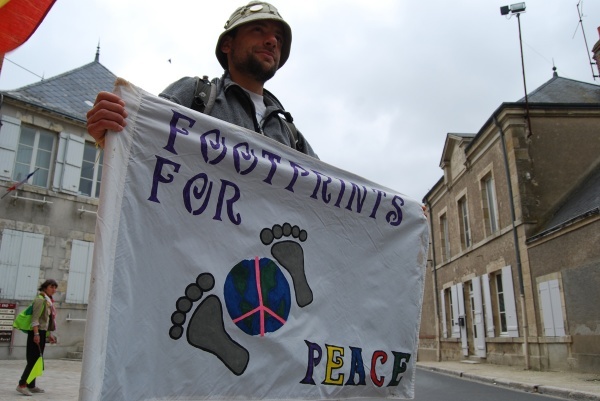 Keep in touch with the FootPrints For Peace web site to see the details and please consider participating. 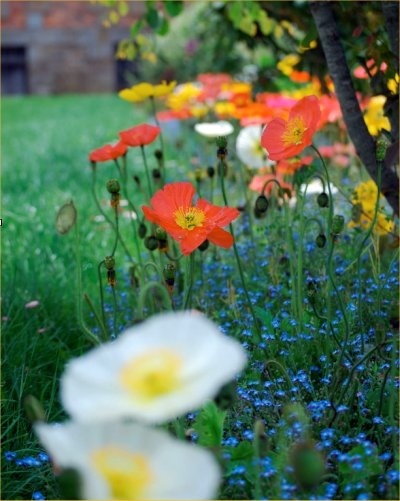 Kindest regards from all the folks at FoorPrints For Peace.